WHY ALL THE RETAIL PAIN? All change – but certainly not the end of the line for the UK retail market. Consumers are king – shifting shopping patterns are the driving force behind deep structural change in retail property markets. Bonfire of the Vanities – retailers are taking a far more forensic view of their store requirements. Each store has to contribute – be that making money directly or providing vital multi-channel support. Change or die. A simplistic, if slightly over-dramatic, reflection of where the UK retail market is right now. Denial is not an option. Affordability Redefined – less about turnover and rent, more about profitability, flexibility and longer-term sustainability. ow has it come to this? A host of recent headwinds have laid bare much deeper structural shortcomings that have been 30+ years in the making. Mistakes and neglect from the past have come back to haunt. 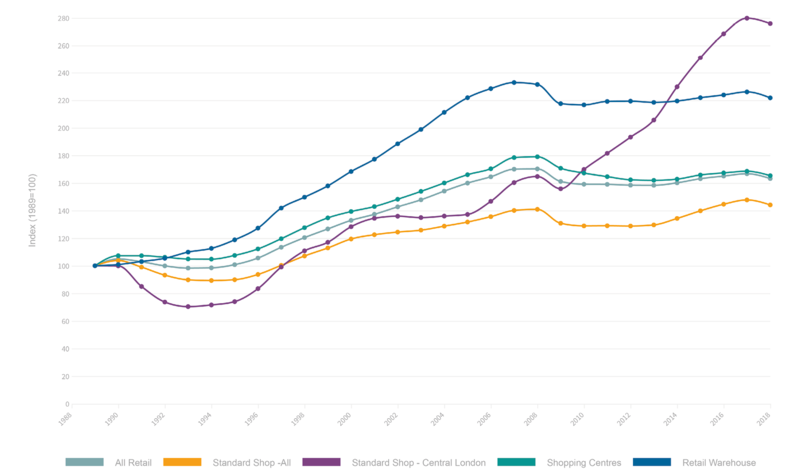 The change UK Retail is undergoing is structural – permanent rather than temporary. Relevance – the key requisite for retail longevity. 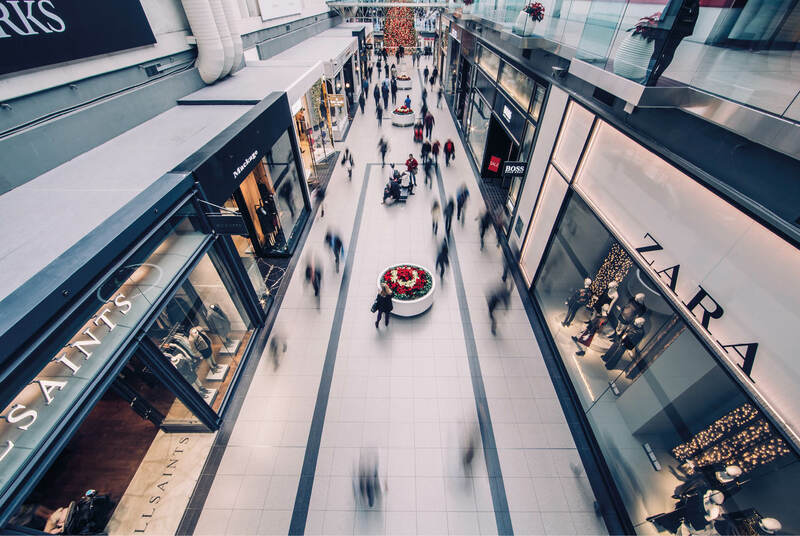 Retail remains an investible property asset class – on a counter-cyclical basis and also where better stock is being miss-priced through all-encompassing negative sentiment. Online a key catalyst to ongoing change – it has a symbiotic relationship with physical stores, but has challenged every established industry metric and parameter. The rise of online is clearly a key catalyst to this change. Rather than merely supplanting or killing physical retail, online has added huge, almost immeasurable dimension (and complexity) to traditional retailing. For retailers, embracing this opportunity has proved almost as challenging as the threat it is perceived to pose. Online has not wholly undermined physical retail, but every historic metric and parameter has shifted. 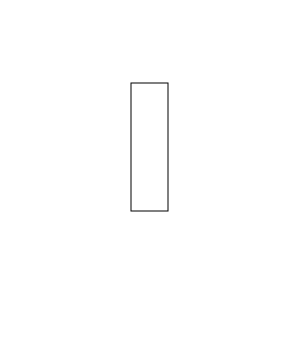 And we are only at the beginning of the journey towards understanding what this means in real terms. The key agents of this change? Consumers, the lords/ladies and masters/mistresses of everything retail. Only by being consumer-centric will retail succeed. Consumers have embraced online, but are not shunning physical retail. Above all else, consumers are channel agnostic – they shop brands rather than channels. The retail market needs to mirror the thought processes of those that define it, rather than continue to treat channels in isolation. A first step towards future-proofing UK retail is understanding where it has come from. The past is not necessarily a portent of the future, but lessons can still be learned. Too much retail future-gazing fails to understand many of the fundamentals of retailing that are constants and will not change. Retail property has to change. It has already, but needs to do so at an accelerating rate. In this report, we highlight six key property pinchpoints – lease terms, incentives, service charges, turnover rents, valuations and business rates. In very generic terms, the two key watchwords are flexibility and affordability. The latter concept extending far beyond the recognised, one-dimensional metric of rents. I’m delighted that we have been able to substantiate our own views with those of key industry figures, representing both landlords and retail tenants – Darren Richards of British Land and Frances Baker of River Island. Both offer a very telling, ‘first hand’ market insight on wider change within the retail market. It would be wrong to view this change as a negative. Retail most definitely does have a future, people will continue to use physical stores in all of our lifetimes. Believe it or not, a high street 20 years from now might not even look radically different from its current incarnation, albeit with a reduced overall retail footprint, a greater sense of purpose and a lot more love. Change, of course, comes at a price, both financial and figurative and this is the central theme of this Newsletter. However necessary, change can also be painful and difficult to navigate. We hope you find this report of interest. As ever, please do not hesitate to contact us if we can be of further assistance in helping you manage change. Retail Darwinism – not all retailers are successfully adapting to change, it is the survival of the fittest and there is a changing of the guard. Virtuous circles – the best investment cases are for retail assets with strong tenants, trading well, on affordable metrics. Income remains the main investment play. An end to the blame game – a key hindrance to necessary market change, landlords and retailers need to collaborate rather than point fingers. Private equity has a lot to answer for. The link between retail failure and private equity ownership (past or present) is anything but tenuous. The ‘traditional’ private equity model should have no place in retail, but sadly this is not case. Retailers may seem attractive to investors in that they are cash-generative, but they also are capital intensive (or rather, they should be if they are run properly). The notions of hefty financial leveraging, extracting cash, asset stripping and flipping may have worked (or seemed to have worked) in the so-called ‘good times’, but have no place now and are increasingly coming home to roost. Many private equity-owned retailers (and F&B players, for that matter) have a history of aggressive, debt-packed expansion. This legacy of debt sits very uncomfortably on their balance sheets long after the private equity has exited the business. It is no coincidence that the vast majority of operators that have launched a CVA or gone into administration (e.g. Maplin, Toys ‘R Us, Maplin, New Look, House of Fraser, HMV, Homebase, Byron, Jamie’s Italian, Prezzos, Carluccio’s, GBK, Prezzo) were/are private equity owned. 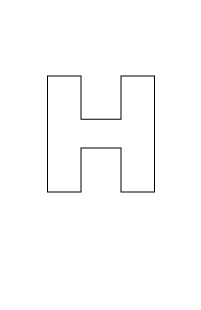 Others (e.g. Debenhams) still bear onerous debt from historic private equity ownership. The message is clear - retailers need to be run as retailers, by retailers, not as cash cows by financiers. But for some it is sadly too late. Retailers have not been proactive enough in weeding out under-performing stores. Every retailer has an ‘ugly tail’ in its portfolio, a proportion of stores that are under-performing and / or loss-making. The proportion can vary, but is typically 10% - 30% of the estate and may even be as high as 50%. Many retailers, including those in acquisition mode, tended to turn a blind eye to their own ‘ugly tail’. Lease structures in the UK are rigid and it is not necessarily easy to offload under-performing stores. That said, it is far better to manage the process proactively over a period of time, rather than retrospectively in one fell swoop. For many retailers, adopting a proactive, managed strategy around lease expiries is a relatively new process. For some, a CVA represents a ‘quick fix’ to legacy ‘ugly tail’ issues, regardless of the collateral damage this will ultimately do to their brand. Online is also widely blamed as a driving force behind distress on the high street. This is a highly simplistic view which does scant justice to the complexities of modern day retailing, where the dividing line between online and physical stores continues to blur almost to the point of no longer existing. Most physical retailers are now multi-channel, even those that have been in a state of distress. They cannot be victims of a channel they are embracing. There have also been retailer casualties in sub-sectors which are largely immune to online e.g. Carpetright. E-commerce is undoubtedly a catalyst to huge structural change across retail markets, but is not single-handedly responsible for all the malaise we are currently witnessing. It is far more complex than that. Retail most definitely has a future, but fundamental change is needed if the high street is to survive and thrive. Neither retailers nor landlords have made appropriate and consistent levels of investment in retail stock. Retail is capital intensive. ‘Build it and they will come’ may be true initially, but most retail locations require ongoing investment if they are to stay relevant. Many retailers have not allocated sufficient capital to maintain upkeep in their stores, prioritising other areas of the business (e.g. making online fit-for-purpose). 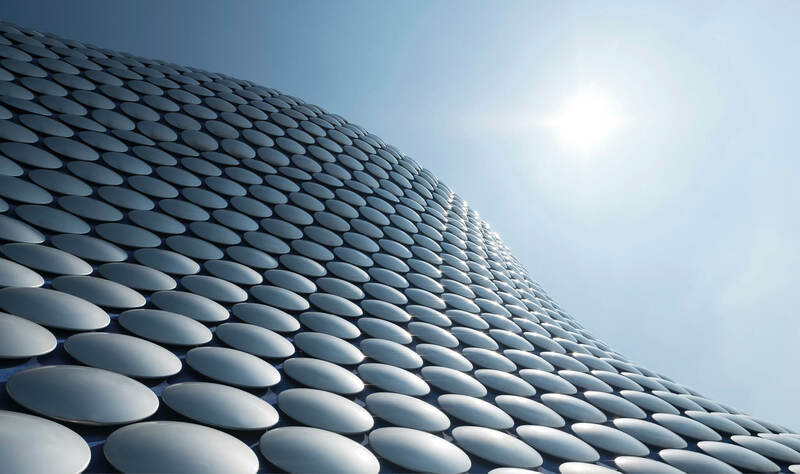 At the same time, many landlords (especially the institutions) have not proactively asset managed their schemes over the years, with the net result that many high streets, shopping centres and retail parks are looking dated and very tired. In an oversupplied market, consumers have a choice where they shop and will gravitate to whichever destination best suits their need on a given occasion. 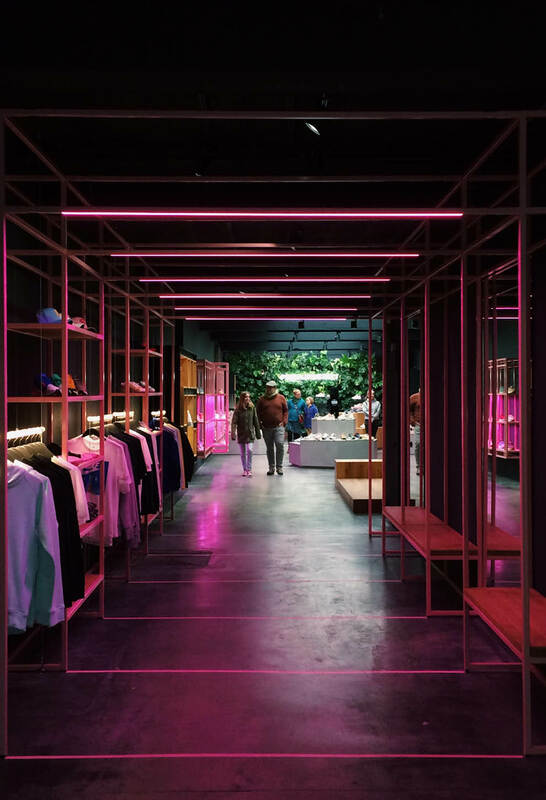 The terms ‘sense of place’ and ‘experiential’ have admittedly become over-used industry buzzwords, but the fact remains that retail needs to go beyond being merely perfunctory. Shopping should be a pleasurable experience and in so many cases, it is not. Forget ‘experiential’. How about ‘half-decent’, ‘invested in’, ‘not neglected’, ‘loved or even just ‘nice’? Not as catchy as ‘experiential’, but definitely far more tangible. These recent headwinds are only the tip of an iceberg that has been 30 years in the making. All too often the root causes of current pain have been swept under the carpet and what we are effectively seeing now is mistakes from the past coming back to haunt. We would identify 10 Key Structural Failings in the UK Retail Industry. The list is by no means exhaustive and is deliberately generic at this stage – potential interventions and possible solutions are explored in much more depth in the ‘Alternative Scenarios’ section of this report. Nor do all the Structural Failings necessarily apply to every retailer and landlord – some have clearly been far better at moving with the times and managing change than others. Solutions to these issues need to transcend slashing rents, closing stores and cutting costs. This is merely tantamount to sticking plasters on much deeper wounds. Only by proactively addressing ‘10 Key Structural Failings’ will the retail market achieve the necessary platform to move forward. ● They have lost focus (on their core customers, what their brand stands for) ● Online has brought added complexity to their business models ● Developing sustainable online platforms has come at significant cost ● Capex has been channelled away from the core store-based operations. Collaboration rather than conflict – but actions speak louder than words. All retail costs are rising faster than retail sales. Rents are not the only costs a retailer has to bear. Over and above cost of sales, there are a whole host of other variable operating costs, including wages & salaries and utilities, to name but two. In aggregate, these are likely to have grown at a faster rate than retail sales for a number of years. 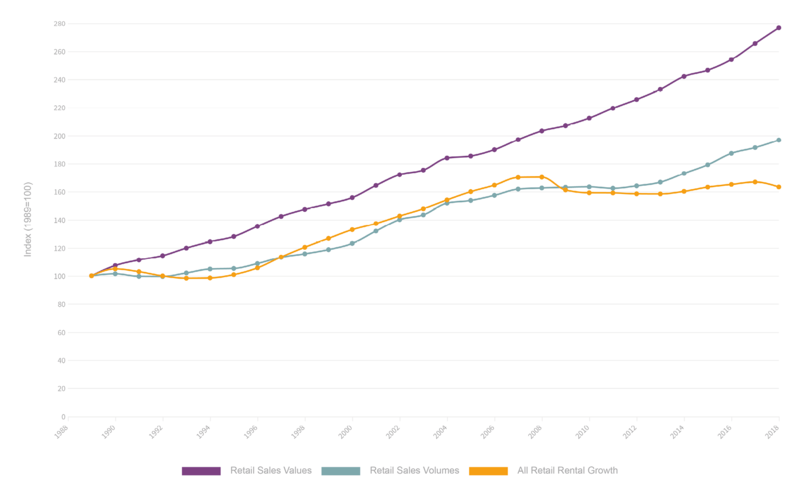 Overall retail sales values grew by 4.2% in 2018 (volumes +2.8%). A seemingly respectable headline figure, but one that includes all retail segments (food and non-food) and all channels (physical stores and online). The reality is that many retailers would have seen far lower growth than this. Yet all are likely to have seen both wages and utilities increase by 5%+. Even if underlying rents do correct (as they did last year, by 2.1%), other costs may not follow suit. Recent, well-documented headwinds are merely laying bare much deeper structural flaws in the UK retail sector. There is too much retail floorspace in the UK. Period. But actually quantifying the level of over-supply is nigh on impossible, as there is no exact science that can be applied to determine optimum levels. National vacancy rates are currently around 12.5% and allowing 5% for ‘churn rates’ and market tension, this would imply a very crude oversupply of around 7% - 8%. In terms of individual sub-sectors, clothing is clearly the most over-supplied. The problem has arisen largely through extended periods of large-scale new floorspace development, particularly in the 1980s and 2000s. The issue was not that new modern floorspace wasn’t needed, much more that there wasn’t a measured process of obsolescence for the stock that was supplanted. Most of the problematic, long-term vacant floorspace is dated and ill-configured for modern-day retail use. Although conversion to other, more appropriate use classes would seem the logical solution, this is often a case of easier said than done. The fact remains that retail values remain higher than other uses and in many locations, the economics simply do not stack up. The level of coverage of these three issues has not necessary been commensurate with their impact on retail occupier markets. The issue of inflation has been done to death in the media since the Referendum vote, somewhat inevitably given the wider Brexit narrative. The devaluation of sterling did spark an initial reverse from deflation to inflation in many retail sub-sectors (but not all, clothing being a very notable exception) and this proved something of a headache for the retailers themselves. But most were hedged against currency fluctuations and even when supply agreements lapsed, the negative effects were largely temporary. Inflation is already annualising and increasingly dropping out of the equation. Even allowing for ongoing uncertainty, Brexit cannot be blamed for wider retail distress. Much has also been made of business rate revaluations. This is clearly much more an issue in Central London and certain towns in the South East and is effectively the ultimate ‘double whammy’ - the reward for a steep rise in rent is a hike in business rates. For many stores in Central London, this could easily be the difference between profit and loss, survival or failure. The system is clearly inequitable, with the maximum increase in 2019/20 capped at 49%, but the maximum decrease limited to just 5.9% - not to mention the fact that any relief is transitional. The government’s move to grant further relief to retail properties with a rateable value of less than £51,000 in no way addresses where the key pinch points are occurring and where pain is at its most intense. This momentum has been maintained. In 2018, retail sales values grew by 4.2%. With inflation annualising and slowly dropping out of the equation, retail sales volumes accelerated on the previous year, growing by 2.8%. Expressed another way, real retail sales growth last year was double that achieved by the wider UK economy (1.4%). Of course, these are the ‘catch all’, headline figures, taking into account all product categories (e.g. food, non-food etc) and all channels (e.g. stores, online etc). They do not tell the whole story, but there is nevertheless one key over-arching message – despite all expectations to the contrary, the UK consumer is continuing to spend. Many of these structural failings are inter-linked and self-perpetuating. In many cases, vicious circles need to be broken as part of fundamental change. There is little value in attributing blame to individual parties. Retailers have brought on some of this pain themselves, but could equally point the finger at landlords. Nor are other service providers, including property agents and advisors, exonerated. Both Central and Local Government also have cases to answer. Rather than assuming collective responsibility, playing the blame game is actually one of the key impediments to change. The 10 Structural Failings we identify are generic. Proactively addressing them will require more specific actions – business rate reform, review of planning policy to facilitate easier change of use, closer collaboration between landlord and tenants (and local authorities), restructuring of leasing deals, increased flexibility, greater transparency, a re-think of incentives, a more equitable process for CVA/administrations, higher but more focussed capital contributions on all sides. 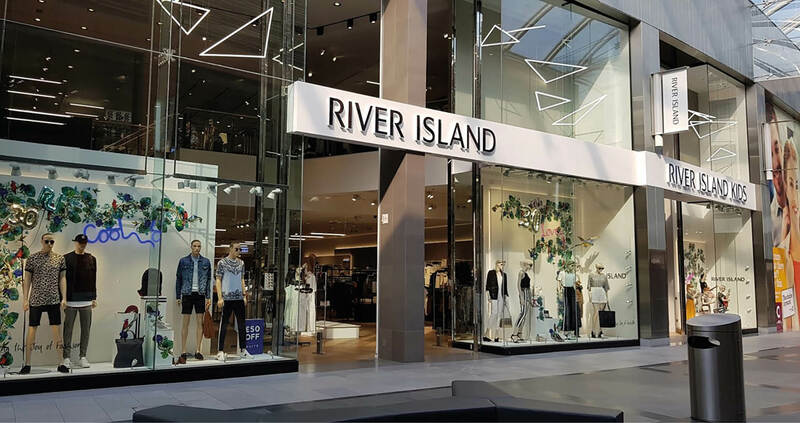 These more specific issues are explored in the ‘Alternative Scenarios’ section of this report – and, more tellingly, in our two guest interviews with Frances Baker of River Island and Darren Richards of British Land. There is no silver bullet for UK retail. There may be some quick wins, but the root causes are deep and complex. There may not be perfect solutions, but we need better answers than we currently have. And to learn from the mistakes of the past. The two most fundamental ‘Failings’ are market oversupply and a lack of investment generally. Retailers opened too many stores. With widespread new floorspace development came more opportunities for expansion. Retailers became embroiled in a chase for space, set themselves highly ambitious acquisition programmes (e.g. 30/40/50 new stores a year) and stuck to them at all costs. The fact that new stores tended to generate better returns and achieved year-on-year like-for-like growth (at least initially) fuelled ongoing demand for more of the same. Private equity-owned operators were particularly guilty on all counts. The chase for market share in the short-term overrode any considerations for longer-term profitability and business sustainability. Typical leases in the UK are long – historically 25 years, latterly 10 years. Occupier demand is now highly selective, but the proverbial horse has already bolted - an overexpanded store network is not easily rectifiable. Denial is not an option – the UK retail sector is neither dying nor in terminal decline, but it is in need of fundamental change. Proactive intervention is desperately needed to right the structural wrongs of the past. Current malaise is largely the result of historic failings coming home to roost. Time has caught up with the retail market. Retail has been taken for granted for too long. Retail is a sector that has historically delivered on every count. As a property investment class, retail has consistently produced above-average returns. Total returns for retail assets have averaged 9.4% per annum since the IPD index was launched in 1981 (and were running at an annual average rate of 11.6% prior to the Global Financial Crisis in 2008). Substantial returns for investors also mean significant fees for other professional services organisations, such as accountancy firms and lawyers, not to mention, property agents and advisors. The UK government also has much to thank the retail sector for. Retail accounts for 5% of national GVA and retail sales continue to increase at a faster rate than the wider economy. Despite its turmoil and widely negative perception, the retail sector is still a boost to GDP, not a drag. 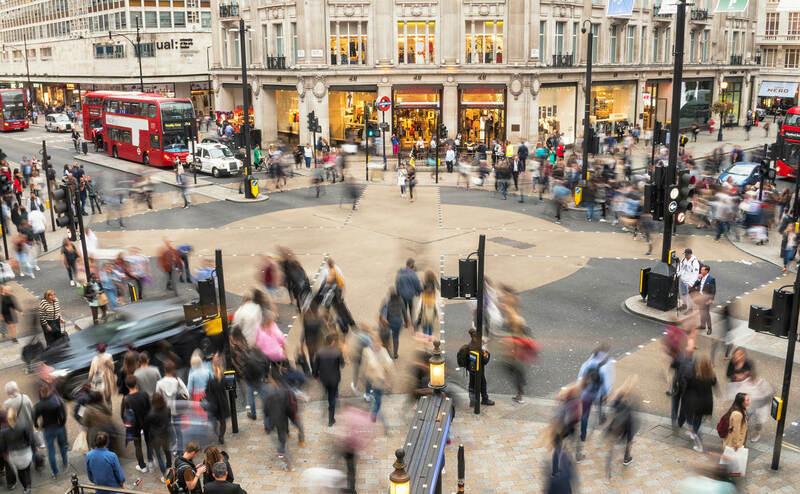 With a workforce of 2.9 million people, the UK Retail remains the country’s second largest employer behind the public sector. More tangibly, UK retailers collectively contribute £7bn in business rates to The Treasury, one quarter of the total generated. UK retail is a major benefactor to the UK economy, yet receives precious little positive support from the government in return. Historic complacency on all sides has seen the sector sleepwalking into its current state. Similar complacency going forward is not an option. “annus horribilis” for the retail market, with a string of Company Voluntary Arrangements (CVAs) and administrations, wider occupier unrest, tumbling capital values and hugely negative investor sentiment. 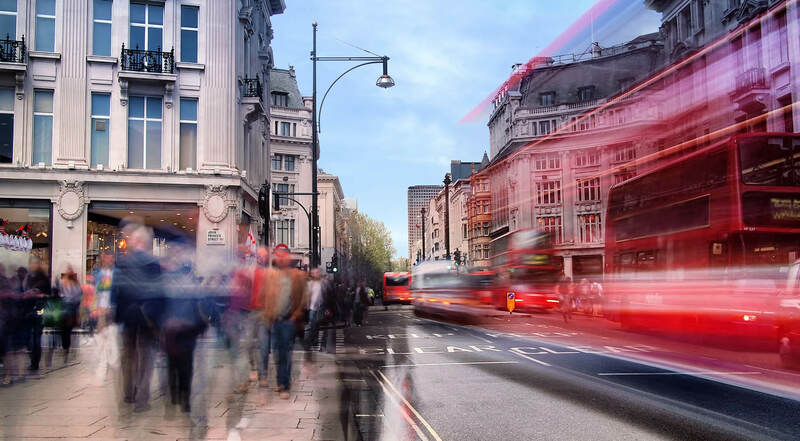 As the dust settles, there is also a growing realisation that this is more than a temporary blip or simply the bottom of a cycle – the UK retail market is changing forever. What has caused the pain? The lazy, naïve or ill-advised point to two key factors – consumer weakness (in part, compounded by ongoing Brexit uncertainty) and the inexorable rise of online. The latter is too simplistic, the former just factually incorrect. This issue is far more deep-seated and complex than that, with a toxic combination of factors coming together, rather than individual forces acting in isolation. These destabilising forces are a fusion of longer-term structural issues and more recent headwinds. There is a tendency to major more on the latter, when really these are merely exacerbating and laying bare much deeper shortcomings. Only through addressing these fundamental structural issues will retail achieve the sweeping change necessary for its long-term survival. The responsibility is a collective one – but perennial finger pointing between retailers/ landlords/ local authorities is an impediment to progress. Faltering consumer confidence and lower spend are clearly go-to reasons for any retailer malaise. However, there is simply no evidence to support the notion of a consumer slowdown in wake of the EU Referendum. Official retail sales data from the ONS showed that retail sales values in 2017 (the first full year post the vote) were up by 4.5%, significantly above the 10 year historic average (3.0%) and the highest level of annual growth since 2004. This performance was, in part, driven by inflation, but retail sales volumes (i.e. real growth) were still up by 2.2%. Retailers have sacrificed ‘brand equity’ for sales and market share. Brand equity is one of vestiges of customer loyalty, whereby shoppers trust the retailer in question to deliver on most, if not all of their expectations – product, price, value, service and experience. The problem is that many retailers have undermined their own ‘brand equity’ over the years with their compulsion to offer constant promotions and discounts – if they don’t cut prices and shout about it, consumers will have no reason to shop there. Black Friday is perhaps the worst manifestation of this and it is no coincidence that retailers who opt not to partake or are passive towards it tend to have the highest ‘brand equity’. A constant barrage of promotions and seemingly continuous discounting are two of the key forces that have destabilised the UK retail sector in recent years. Brand equity in retail is everything and constant discounting completely debases this. Price fluctuations send out very mixed messages and confuse consumers. If a retailer doesn’t appear to have faith in its own brand and pricing, why should its customers? Too many retailers are alienating the most important facets of their whole business – their customer base. Most store-based retailers have successfully made the transition to become multi-channel operators but at huge cost, both financial and figurative, to the rest of the business. Of the three ‘headwinds’, rises in minimum & living wages have received the least coverage, but are probably the most damaging for the retailers’ themselves. Few are likely to risk the PR own-goal of calling into question the increases, but the impact is very acute. From April, the minimum wage (for those aged 25 or over) will again rise from £7.83 to £8.21. A rise of 38p may seem notional, but will result in retailers’ wage costs increasing by at least 5% - another example of costs going up at far faster rate than sales. Pub operator Wetherspoon’s is one of the few to break rank and report what these increases mean in real terms. In its Q2 results release in January, the business flagged that labour costs had increased by £30m over the reporting period. Many of the large retailers are probably being saddled with a similar increase, if not an even larger one. No wonder that most are desperately looking to rationalise their workforce accordingly. Beneath the somewhat alarmist headline figure of 148,000 retail job losses in 2018 (according to the Centre of Retail Research), there were an estimated 24,200 losses through corporate restructurings (as opposed to CVAs or administrations). Altruistic as increases in the minimum and living wages are designed to be, retailers still need to balance their books. It is a false economy and the inevitable compromise of having to pay staff more is to have less staff. This is an uncomfortable cost equation that usually flies under the radar. Property costs continue to rise faster than retail sales. Although this is not always the easiest to prove. Whatever has occurred in the wider economy, retail sales growth has been fairly robust for as long as records exist. 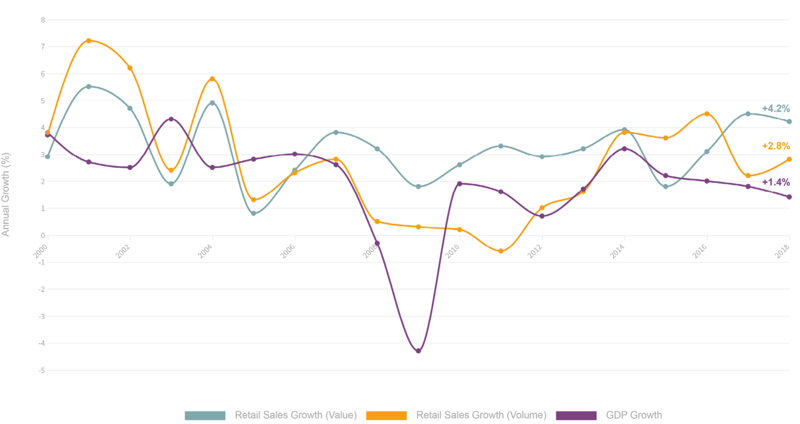 Since 1989, retail sales values and volumes have grown at respective annual average rates of 3.7% and 2.4%. Cumulatively, therefore, they have grown by 177% and 97% respectively over the last 30 years. Retail rents have been more erratic. Figures from MSCI (formerly IPD) show that overall retail rents have grown at an average annual rate of 4.0% since the index was conceived in 1981. Since 1989, the annual rate of growth has been lower (2.1%), amounting to cumulative growth of 63%. Of course, these figures do not factor in regional and asset-specific variations, which could show marked differences. The top line figures do not necessarily reflect what is happening on the ground. Historically strong occupier demand and a general chase for space have obviously driven rental growth in the past, possibly to unaffordable levels in certain locations. However, ‘spiralling rents’ is still something of a lazy conclusion to reach – it assumes that rents only ever go one way and don’t correct (they do) and they are continuing to rise (in all but very isolated cases, they aren’t). But any sort of rent increase is still a heavy cross to bear for an ‘ugly tail’ store or one that is seeing annual sales go backwards. 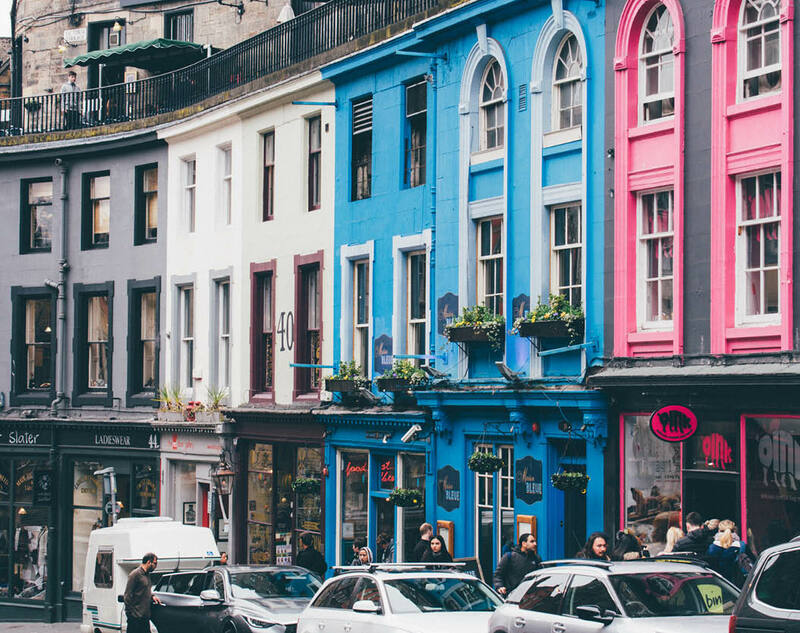 When it comes to determining what constitutes an ‘affordable rent’ in a retail capacity, there are areas of both mutual benefit and conflict for the landlord and tenant. Shared areas of benefit include quality and suitability of space as a retail environment; the space’s overall configuration; promotion of the retail location; design and its sense of placemaking. All these factors are important for increasing footfall and driving sales. Higher sales may, in turn, facilitate better rental income possibilities, although with this also comes the threat of higher business rates, which ultimately work against both landlord and tenant. Landlords and retailers also have diverging goals. A key component of a retailer’s model is to maintain profit levels by keeping store costs (including rent) as low as possible, to maximise overall returns. A landlord’s performance depends on achieving maximum rental income, so there is inherent conflict in those two positions. Sustainability is as important as cost for both parties. For a retailer, affordability assumes that the rent can be paid over the full term of the lease and profit maintained. For the landlord, affordability equals sustainability too, in terms of ensuring that the income will continue throughout the lease and that any adjustment to it e.g through rent review, CVA fall-out or other external event, will not render it unaffordable. eople might think the term ‘affordability’ is simple enough to define, and usually do so approaching it from the perspective of an individual looking to buy something. That person, according to the Oxford Dictionary, will ask themselves is what they’re looking to buy “cheap enough that [I] can afford to buy or pay for it”. This perspective is limited in its scope however, as something being “affordable” is a key transactional component for both buyer and vendor. have been eroded by a decade of rampant rental growth, exacerbated by significant rates increases (and with limited benefit of transitional arrangements). Selfridges’ rates payable, for example, are set to increase from £10.93 million in 2016/17 to £17.4 million by 2019/20 (+£6.47 million or +59.3%), while Nike’s across the same period are increasing from £1.43 million to £2.70 million (+£1.27 million or +88.8%). This trend is evident in many of the Top 30 UK shopping centres, particularly in the wake of recent CVAs, including those of New Look, HMV and Paperchase. The discounted rents achieved against passing (or even closures) are setting the tone for other operators who are increasingly basing their own profitability calculations on those adopted by another player under the CVA. CVAs remain a huge challenge for both landlords and other tenants. For landlords, there are the obvious issues of loss of income or void. At the same time, successful retailers are finding themselves trading against a two tier cost platform, whereby struggling competitors are benefitting from discounted CVA rent levels. 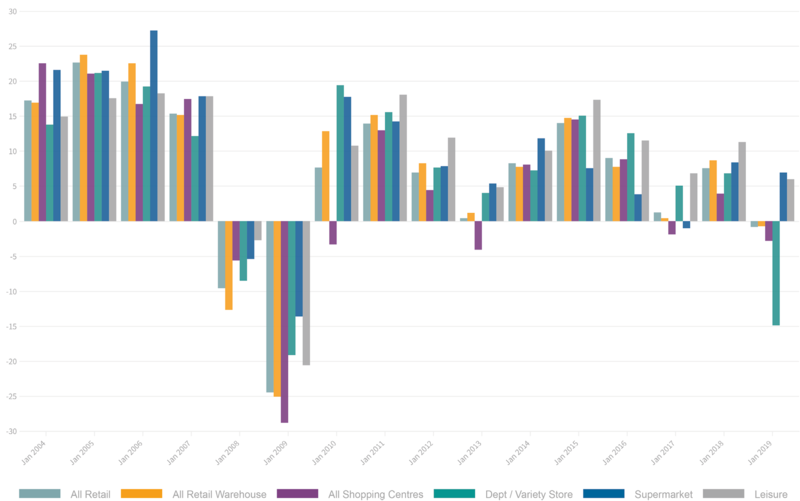 Retail hurdle rates have risen significantly in recent years with ‘effort ratios’ – or occupancy cost ratios – becoming ever more stringent for a number of reasons. The rise of online (at the expense of in-store turnover) is one of the key factors behind this. Although there is a symbiotic relationship between stores and online, the multi-channel model is still evolving. As Simon Wolfson, CEO of Next, has indicated, it may take ten years for us to fully understand the true interaction between shops and online sales. For now, the weighted shift in turnover growth from physical stores to online is reflected in most retail site appraisals as a 2.5% to 5% annual compound, offset by year-on-year turnover, when appraising new store affordability. ‘Effort ratios’ are currently targeted to be a maximum of 15% of gross store turnover. Note that this ratio is based on total occupancy costs and therefore includes rents, rates, service charge, any turnover rent payable and building insurance levied. This target percentage is pretty much standard for retailers across all sub-sectors, from value operators to department stores. There are circumstances when these parameters may be relaxed, particularly in the case of flagship stores, whose role is as much to raise profile/ brand awareness and act as a showroom for the brand. 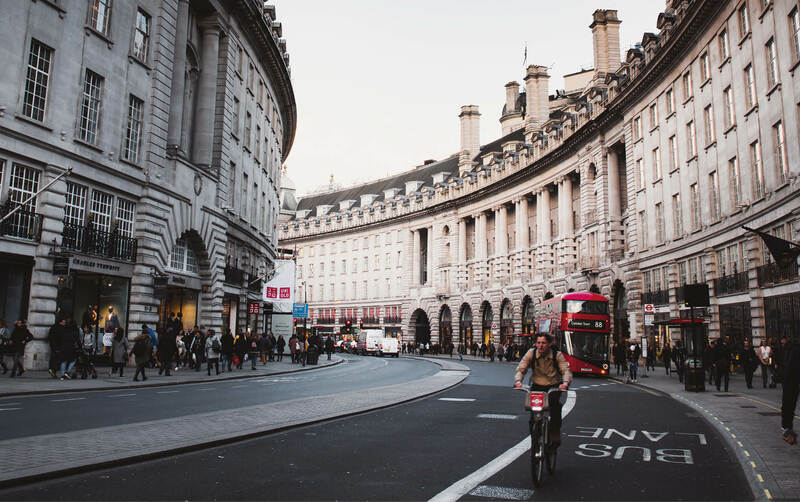 This tends to be limited to a select few locations – Central London (and Oxford Street in particular) and the very best Regional Shopping Centres (e.g. Westfield London, Stratford City, Bluewater, Trafford Centre). 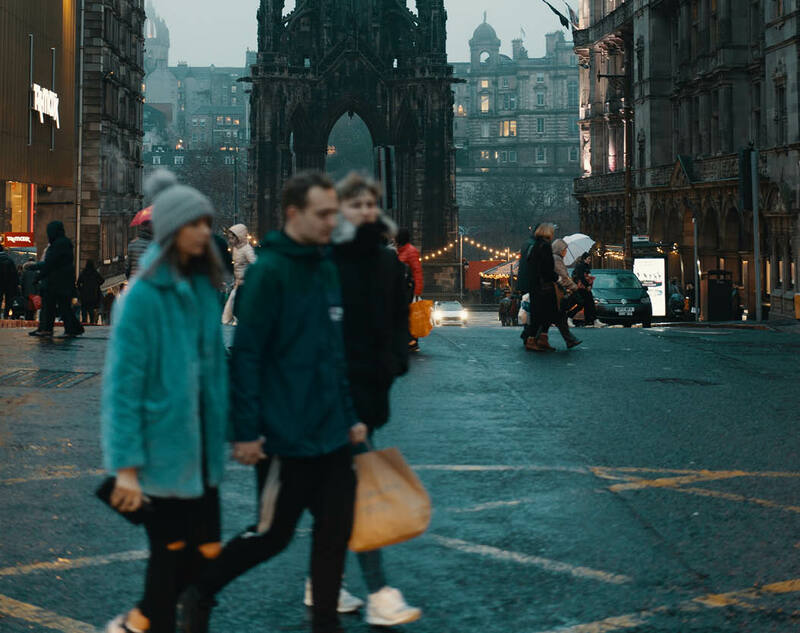 Instances where retailers deviate from key profitability criteria for perceived wider brand advertising are rare outside of Central London, but may occur in major metropolitan cities such as Manchester, Birmingham or Glasgow. If total occupancy costs increase above 20% against gross store turnover, it’s likely there will be performance pressure on the store. In these instances, any efficiencies that can be found via lower business rates or more efficient service charge costs (without affecting key provision) will help protect the rental income element for the landlord. Fully inclusive turnover rents are becoming increasingly commonplace and generally these deals are structured to minimise long-term risk for both landlord and occupier, and any immediate or subsequent affordability pressure that might occur. Rents can be agreed as a fixed turnover percentage, usually in the range of 12% to 15%, although sometimes less or more depending on location, individual shop, and retailer in question. So, what can both landlords and tenants do to maximise affordability – improving individual store performance and therefore profit, whilst also facilitating the best environment for generating rental income and growth? Lower business rates, more competitive service charge costs and creating retail environments that encourage footfall will help alleviate compression on net rental levels. For their part, retailers need to continue investing in their stores, retailing model and evolve their offer and concept to meet ever more demanding customer expectations. At the same time, they need to accept multi-channel realities and fully exploit the relationship between online and physical stores – after all, the conversion rates for in-store sales often match or exceed those from people browsing online. 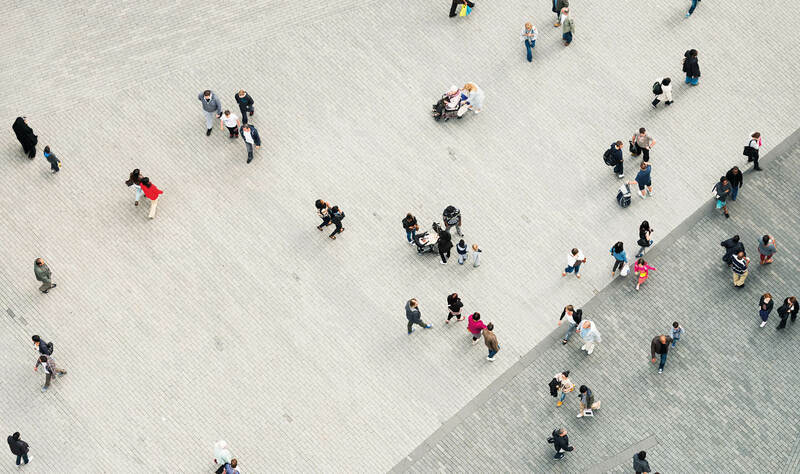 Looking ahead, the notional 15% threshold (or target) for total occupancy costs is unlikely to change and profit – rather than turnover – remains the key driver for retail occupiers. In reality, this may result in further downward pressure on the 15% ‘effort ratio’ for individual store parameters. 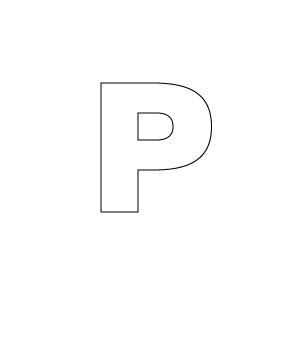 Recognising sustainability of profit over the committed term of the lease is also required now, both to ensure the certainty of income return for the landlord, and profitability over the period of the lease for the tenant. This sustainability and concern over future cost fluctuations through external influences, consumer behaviour or ongoing transfer of overall sales growth online has so far meant retailers are increasingly pushing for greater lease flexibility or turnover rent lease structures, and this is likely to continue. Finally, while an individual store may meet affordability parameters and be within the 15% threshold on occupancy cost, occupiers will in reality seek to minimise their cost model by pushing down rents as much as possible, while landlords aim to maximise the rental income they can secure by consciously agreeing to a lease deemed to be within the affordability threshold for the occupier over its full term. Ensuring that the retailer can trade profitably over the full terms of the lease, while the landlord enjoys security of income and possibly even rental growth. The balance is a delicate one – and one that may require recourse to expert analysis and advice. Affordability is increasingly less about sales and rental costs and more about long-term sustainable profitability. The Online Business Dictionary says it best, drawing the conclusion that ‘affordability’ is determined by “the analysis of the lifecycle cost of a proposed acquisition, that the purchase is in accord with the resources and long term requirements of the acquirer”, meaning for something to be affordable at the point of purchase, it must not compromise the purchaser’s financial health in the future. 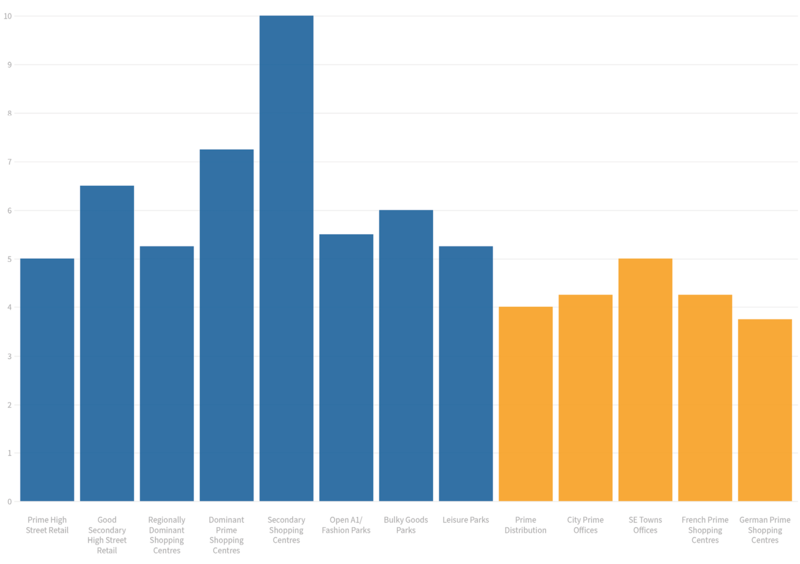 Keeping the science to a minimum, comparing the two datasets across the 300+ centres yields a correlation index of 0.67 – in very crude terms, around seven in ten centres follow a distinct pattern, this being that the relative spend levels (and by implication, the strength of that centre as a draw) is reflected in rental values. More interesting than those that do follow the ‘high clout = high rent’ pattern are those that don’t (referred to as ‘outliers’). 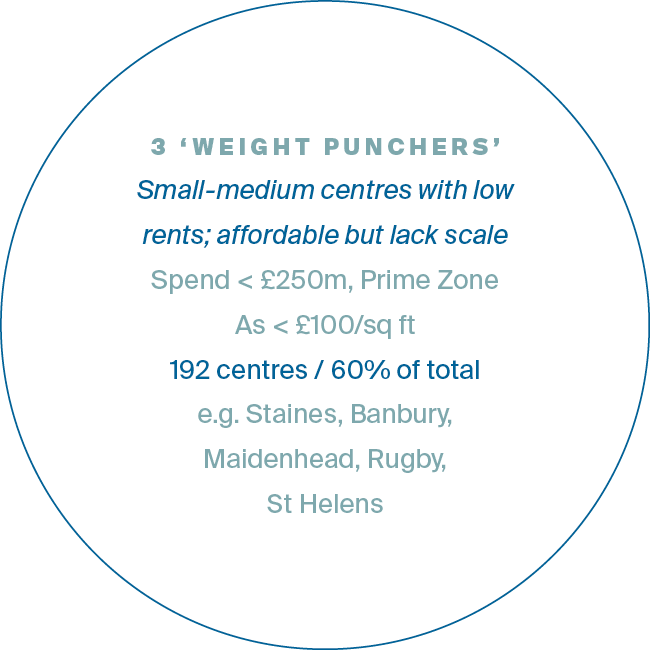 As before, we have also divided the 300+ centres into four key segments (see accompanying infographic) based around the parameters of prime zone A rents greater or less than £100/sq ft and gravitated spend greater or less than £250m. 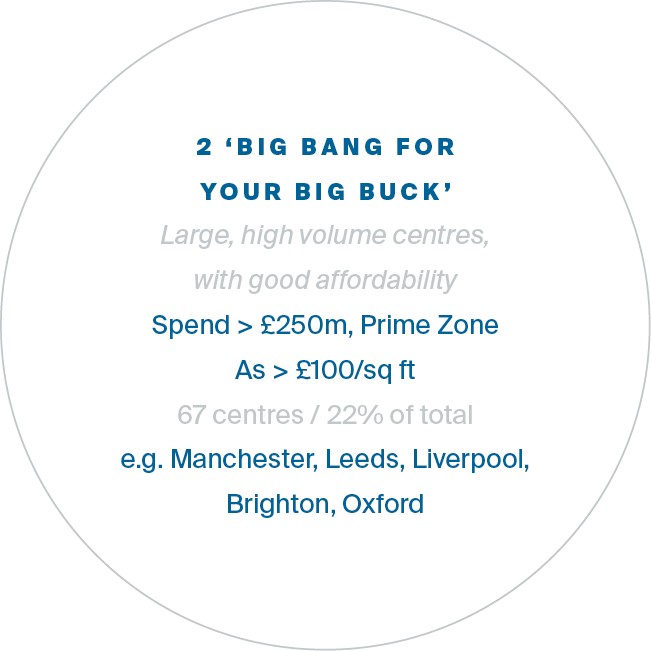 These parameters are not altogether arbitrary in that the correlation model suggests that a centre generating spend of £250m will achieve a prime zone A rent of c.£100/sq ft (£101/sq ft to be precise). Prime retail rents generally have re-based by 25%-30% since the Global Financial Crisis in 2008. Some centres have become more affordable, others are still re-basing. n the current retail environment, affordability (in very basic terms, whether a retailer can pay the rent) has risen to the top of the agenda. And I would argue unequivocally that it should always be top of the agenda - the fact that in the past it maybe wasn’t is one of the root causes for the current malaise we are now enduring. 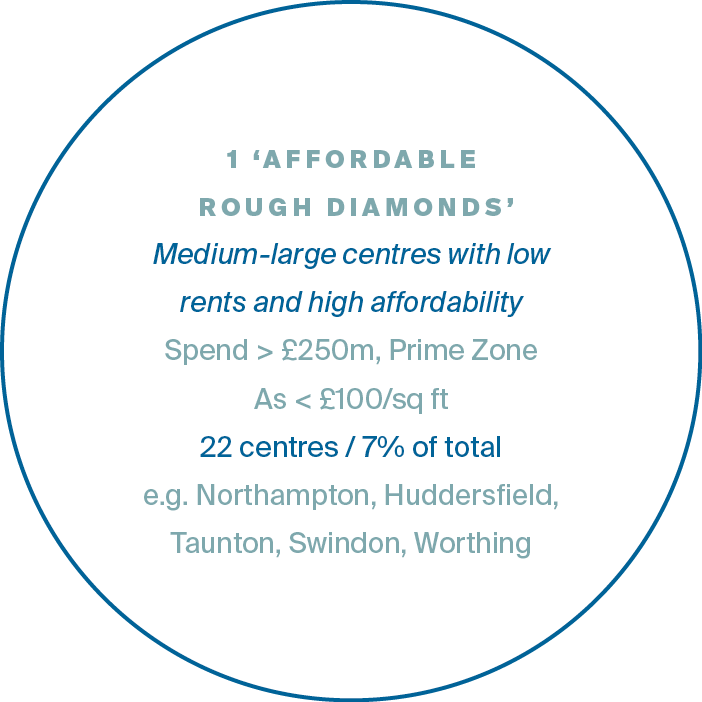 But affordability is a very relative concept – it varies by retail sub-sector, individual operator, town/centre and pitch. an interesting case as it is on the cusp of both parameters. Spend has risen to take it above £250m, but rents have come off marginally to £95/sq ft. By extension, it is slowly becoming more affordable. Over the past three years, Darlington is the only centre were spend has gone backwards over the £250m mark, while Carlisle is the only centre where headline rents have fallen below the £100/sq ft threshold (£95/sq ft now versus £110/sq ft previously). A number of the changes involve centres moving from being ‘Weight Punchers’ to ‘Gravity Defiers’. 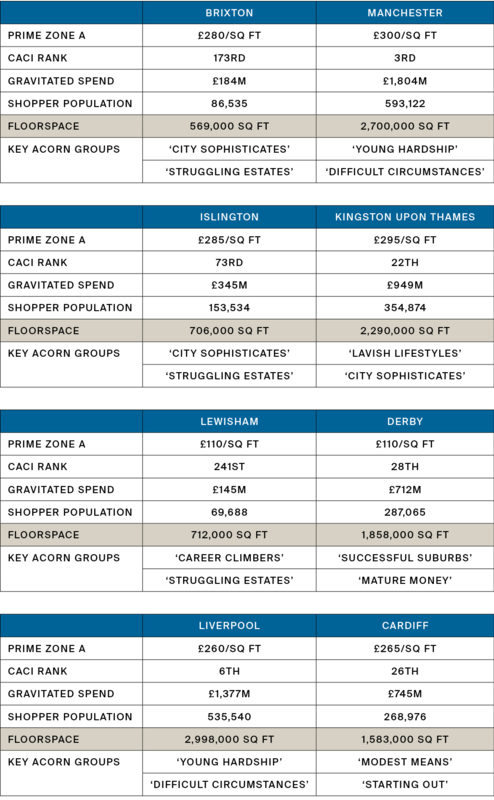 Most of these are Greater London centres that were previously bubbling just below the £100/sq ft zone A mark and have now kicked on. These include Kilburn High Road (£100/sq ft), Peckham (£120/sq ft), Tooting (£120/sq ft) and Enfield (£127/sq ft). But spend has remained fairly constant in all of these, at best. They are not necessarily unaffordable, but they are increasingly less affordable than they were before. The lesson here is that affordability is not only a relative concept - its parameters can even change in a relatively short space of time. 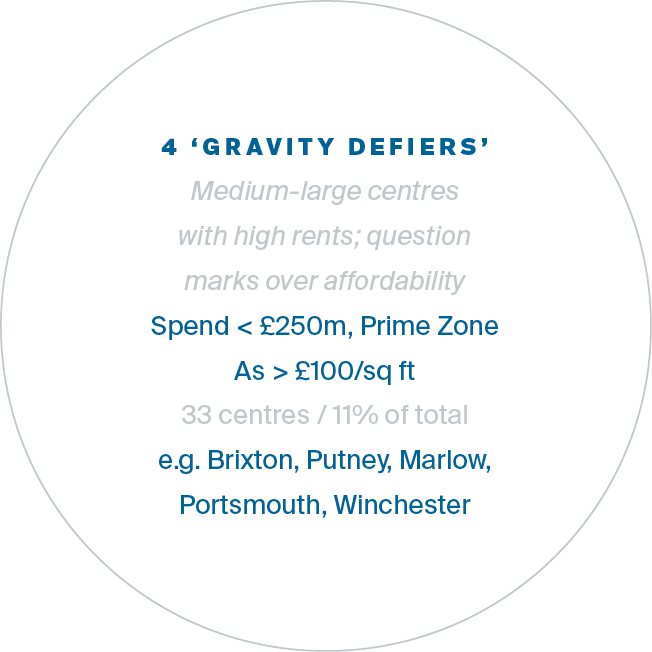 What about the other end of the spectrum - ‘Gravity Defiers’, where rents look expensive relative to the clout of that centre? Even allowing for the exclusion of the major retail destinations in Central London (Bond Street/Oxford Street/Regent Street, Covent Garden, Knightsbridge, Chelsea), the list is dominated by centres across Greater London – Camden Town, Brixton, Hammersmith, Islington, Richmond, Clapham Junction, Chiswick, Kilburn, to name but eight. Shopping propensities are undoubtedly different in the capital. Shopping patterns are far more fragmented, with people tending to shop a host of locations, as opposed to having a particular allegiance to the one that is most local to where they live. From a technical point of view, this is likely to mean that the modelled spend data is possibly understated for certain, smaller centres. But the fact remains that rents in many London locations are aggressive and for all but the right operators, unaffordable. Brixton on a par with Cambridge and Kingston? Lewisham with Derby? Clapham Junction with Bath? Islington more expensive than Oxford, Cardiff and Liverpool? Where will retailers make the most money? Again, it is very much horses for courses, but the Outer London centres are not necessarily a goldmine for all operators, certainly not if rental tones are excessively high. The list of ‘less affordable’ centres also includes a number of attractive ‘market towns’, both relatively large (e.g. Winchester, Chichester) and small (e.g. Henley-on-Thames, Marlow, Sevenoaks). By virtue of their aesthetics, these towns offer a far greater sense of place than some of their less celebrated counterparts and will always draw footfall on this basis alone. They are also something of a magnet for some of the more aspirational retailers, who are more willing to pay a rental premium. The question is when this premium becomes excessive and rental tones become unaffordable to all but the best traders in that centre. Anecdotal evidence would suggest that in some, we are already past that tipping point. Affordability may be more challenging (and possibly elusive) in the major regional malls and the much-lauded affluent market towns in the South East. Most of the major regional cities offer high levels of affordability – Glasgow, Manchester, Leeds, Liverpool and Birmingham are all ‘above the line’. Despite their status and huge shopper draw, most of these are still ‘cheaper’/ more affordable than many centres in Greater London, all the Regional Malls and certain towns in the South East e.g. Southampton, Guildford. For all its merits as a centre and the affluence of its catchment, are most retailers likely to make more money in Guildford than they are in Manchester or Leeds? The answer will, of course, vary by individual retailer and the relativities of pitch quality. But the fact remains that most of the regional cities still offer retailers considerable bang for their buck. A tier down from the major regional cities, the likes of Derby, Leicester, Norwich, Preston and Aberdeen also score highly on affordability. In undertaking this analysis, it is difficult to not draw convenient North vs South divides. That said, an overwhelming majority of the ‘under-rented’ centres definitely are in the Midlands, North and Scotland. But there are examples too in both the South East (e.g. High Wycombe, Eastleigh, Poole, Worthing) and the South West (e.g. Plymouth, St Austell). There are also some unlikely names in the ‘under-rented’ category, including Brighton. Most centres have seen prime rents re-base considerably since 2008 – PMA estimate by an average of 28%. Brighton is one of only a handful of locations that go against this grain and prime zone As remain constant at around £250/sq ft. Our model even suggests upside and that a centre generating annual spend of £894m per annum (as Brighton does) should be achieving prime zone As of £300/sq ft+. Any talk of potential rental growth seems misguided in the wider context of the current retail market. Where we would have previously highlighted ‘rental upside’, maybe we should now just be taking comfort in ‘affordability’ and wider tenant contentment? In contrast, most of the major regional cities (e.g. Manchester, Birmingham, Liverpool, Glasgow) still offer retailers considerable ‘bang for their buck’. Affordability has taken its rightful place at the top of the retail agenda. It is much more than an industry buzzword. That is notwithstanding the relativities of location. The property industry is still very lazy in its understanding of where retailers trade well and actually make money and where they don’t. Access to any retailer’s store-based trading P&L data will bear this out, with the most unlikely towns and locations often proving to be the most lucrative stores. Paradoxically, one retailer’s treasure may be another’s trash – two adjacent competitors with very similar market positionings and propositions may have wildly contrasting trading stories. The affordability metrics will be markedly different for each. Of course, the rise of online has muddied the waters even further. In a multi-channel world, the contribution of an individual store goes beyond the money that it takes through the till. But this encompasses so many facets (e.g. click & collect fulfilment, returns repository, marketing, brand building etc), this wider contribution is almost impossible to quantify with any degree of accuracy. The haziness of affordability quickly becomes a complete fog. Of the various buzzwords that have been touted as providing salvation for the high street, “affordability” will always trump “experiential” – but the two need not be mutually exclusive. industry affordability than merely slashing rents. Rent is just one variable in a much broader affordability equation. The bigger piece involves ensuring the right retailer is in the right space, and that space is right-sized. And the responsibility for that happening is a collective one between both landlords and tenants. All that glitters isn’t gold – many retailers may struggle to trade profitably in higher profile, ‘prime’ locations. Had retailers (and landlords) kept better control of property costs relative to individual store performance levels, many of the structural failings may have been kept in check. Or better still, not arisen in the first place. Affordability remains a very relative concept. For one thing, retailers from different sub-sectors operate off completely different gross margin structures. These need to be put into the context of volume and stockturn rates. Even within the same sub-sector (e.g. grocery) different operators may adhere to fundamentally different business models (e.g. Aldi/ Lidl vs The Big Four). The notion of what is affordable will vary considerably from one retailer to another. Affordability transcends rental values and is part of a much bigger piece – ensuring the right retailers are in the right space and that space is right-sized. Retailers don’t open stores for fun and don’t occupy space out of vanity – they need to trade profitably and make money. At the prime end of the market our regionally dominant assets/experience-led destinations must have a sound future. Footfall levelsof 20m+ per annum still carry huge potential. In some cases thereare concerns over retailers’ profit levels off high cost levels. However,these locations still drive high turnover volumes for the retailers andthe marketing benefit from having an excellent store in such a locationshould not be under-estimated. Furthermore, the “online halo” is still being quantified but recent research from REVO states that 30% of all online sales need a physical store for part of the fulfilment process. Furthermore, when a store opens, a brand’s online sales increase by an average of 12% in the catchment. 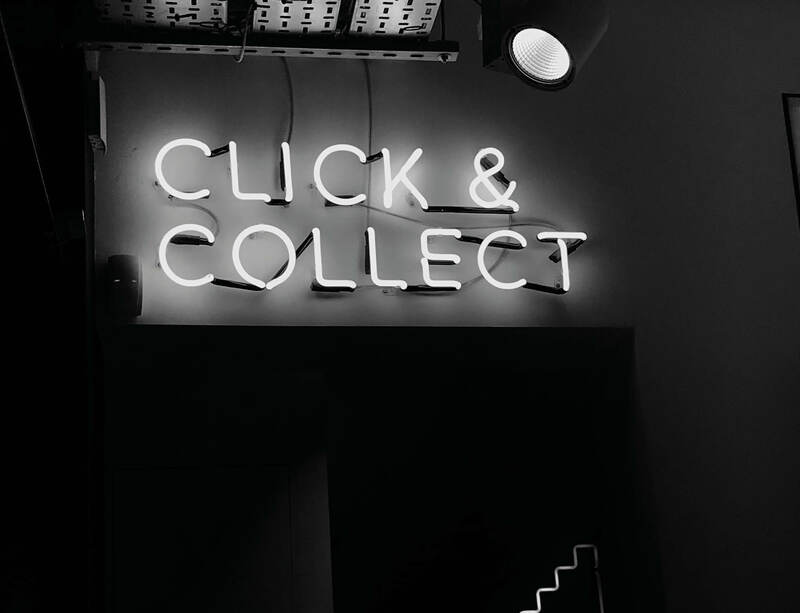 Other research shows that 61% of click & collect purchases result in additional in-store sales, making this a key focus area for retailers going forwards. In some locations there is a need for an occupational cost adjustment, even in these strong centres. However, with an adjustment of perhaps 10-20% in rents to give retailers some breathing space, landlords can then hopefully stabilise rents at that level whilst being creative to maximise the wider success of the location, driving additional revenue streams over the whole site. For our large fashion parks the landlord’s position can be harder than in regional shopping centres, especially where the offer lacks a strong leisure component. Nevertheless, these stores can be hugely important to the retailer for turnover, profit and marketing and we think it unlikely that fashion retailers will notably retrench from the UK’s leading parks in the foreseeable future. Landlords need to find ways to broaden the appeal of these locations, typically by introducing more leisure use, cutting and carving units to create more flexibility/ affordability, and looking to attract the potential new wave of retailers to the out-of-town world, such as Primark, Superdry, Fat Face and Hotel Chocolat. Long term investment in prime appears a sound strategy, and with price correction now offering yields in the 5-6% range, we believe these assets can offer good investment prospects over a five year+ horizon. Our third pick is the high street - as ever probably the safest (or least risky for the glass-half-empty of our readers out there) retail sub-sectors. Yes, the high street gets generically banded into one group and the press usually accompanies the words alongside images of the Grim Reaper. However, it is a large sub-sector of hugely varying qualities, and we still see elements we like. We have spent considerable time over the past couple of years pondering change and assessing which towns/ cities will end up winners and which losers. What is apparent is that if you walk the top 50-75 towns you will see very few (decent) vacant units in prime pitch. These locations still offer huge footfall and are still open 24 hours a day. They appeal to a wide variety of users including A1, A2 and A3 retail. These streets generally offer a good environment (well all of our top 75 do as we’re not ranking by size but by overall prospects – e.g. Winchester and Chichester). Finally, these units are free of hefty service charge, which can be the difference between affordable and unaffordable. Of course, there will be some over-renting in these locations, particularly where there has been strong growth over the last decade. Re-based/ appropriate rents are essential. However, where faced with a challenging renewal (e.g. where a fashion retailer perhaps only wants to stay on turnover terms), there is less impact of saying “no” where you don’t rely on that tenant to encourage others to stay nearby. As such, the “gun to head” situation faced by many multi-let owners on key renewals will not apply on the high street. The landlord can afford to let the retailer go and re-let to a new user, even if less desirable/ less of a footfall driver, on the most favourable financial terms the market allows. In a low return environment, the right High Street investments appear to offer sound medium term prospects and decent on-going liquidity. We can foresee Funds re stocking their high street portfolios early in the next decade. What is clear, however, is that income returns from the sector are now attractive. Set against history, other sectors and other geographies, retail now offers the investor an apparently high income return at day one - an encouraging starting point. However, potential negative capital movements are still a great concern and could undermine the apparent high income return to such a degree that retail could produce zero or even a negative total return in the short-term. So the question investors need to ask is: can we stabilise these capital movements to ensure the high income return drives decent total performance? With yields seemingly sufficiently attractive, it is then a question of whether rents, or arguably total net income streams from the assets, are sufficiently stable. Where do we feel most comfortable? Where are we likely to see stability first? What would we be looking to load up on in our counter-cyclical portfolio? 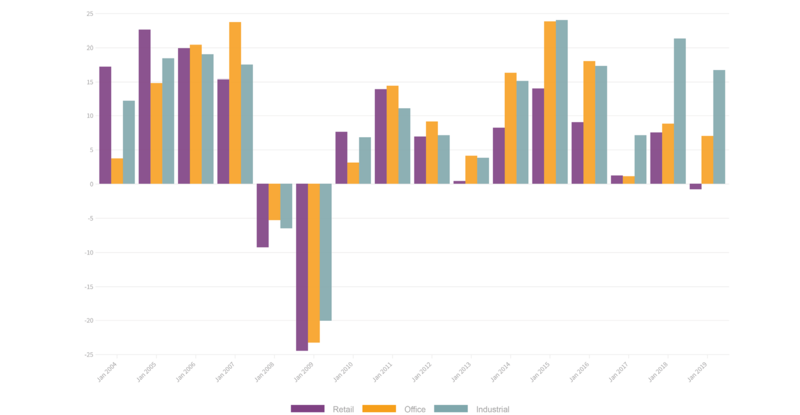 Within those returns, the retail sub-sectors show a range of performance, with the travails of the department store sector very apparent in the latest annual returns. Shopping centres have also been a notable recent underperformer, whilst the leisure market can hold its head relatively high. and industrial. As a result we are now seeing the historic recommended MSCI target weightings to retail being challenged. Prospects remain asset-specific – understanding market dynamics and tenant trading performance is always key. With yields sufficiently attractive, it is a question of where total net income streams from assets are sufficiently stable. High street – hero or villain? Retail: a sound counter cyclical investment? History would indicate that after a period of chronic underperformance there usually follows a period of strong, even outperformance, as markets recover from what is usually an over-correction on the down side. So can that be expected? If so, when and where? Markets are cyclical and there are few who would argue that at some point retail will stabilise and recover. However, there is plenty of reason to be cautious this time. The changes we are seeing in the retail sector are deep and structural. As such, it may not be appropriate to simply look to historical market patterns in making our future forecasts. At the other end of the market we have a high degree of confidence in convenience retail and think even today (without the need for significant further price correction) this makes for a sound investment. We acknowledge there is some over-renting in the supermarket sector but we feel confident over the long term prospects for the market. 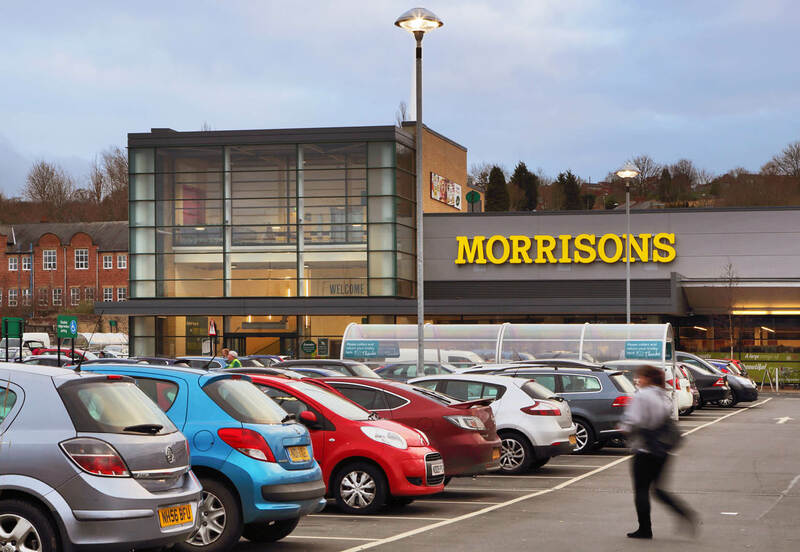 We believe that nervousness of mass store closures in the wake of the proposed Sainsbury’s/ Asda merger was misplaced, although some of this concern has abated anyway given recent disclosures from the CMA. The supermarkets are still major footfall drivers with online penetration into grocery currently only 6% and unprofitable for the large operators. Physical stores are still the major contributors of profit for these businesses and, as such, we are confident that they will remain crucial for the foreseeable future. They also offer the best facilities to service deliveries if online does play a bigger role in the grocery market going forward. Situated alongside (an appropriate) foodstore, a right-sized collection of unit shops should continue to thrive. Shop rents here are typically sub £100,000 per annum. These locations can support an element of fashion but for most it is the daily “needs-based” retailing that works best (Boots, Specsavers, Holland & Barrett, Ladbrokes etc. ), as well as an appropriate mix of coffee shops and diners. These investments typically offer a supermarket at a modest discount to a standalone equivalent, with the unit shops parade included at an attractive apportioned high yield. Yet each help enhance and complement the other and logic would say a premium should be paid for this winning combination, rather than the current discount paradoxically applied. In the same vein we remain confident on the prospects for much of the bulky goods market, particularly for well-chosen standalone retail warehouses. In these areas we are looking for convenience goods retailing in convenient locations. Typically these are let off a modest rent and we are specifically searching for those showing a high level of tenant contentment. This does not have to be about affluent locations or the south east of England, albeit the latter can often better demonstrate viable alternative use value. 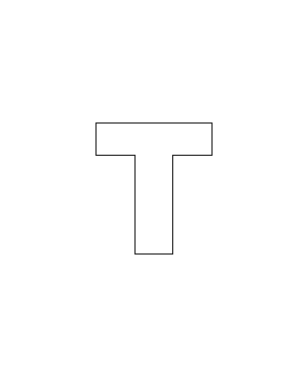 However, we would argue you are better to have a highly profitable store in an unfashionable town than a poor trading store in a perceived top town. New development is likely to be limited in the near future and so as the landlord of a highly profitable store, you have a high percentage change of renewal. In a market where the income return is attractive, a medium length lease term to override the current malaise and a sound business proposition at retailer level appears an attractive investment proposition. Knight Frank’s three key investment picks: 1.‘A flight to quality’ – prime, regionally dominant assets/ experience-led destinations 2.‘Affordable convenience’ – foodstore anchors with ancillary ‘needs-based’ unit shops plus strong trading retail warehouses 3.‘High street heroes’ – top 50-75 towns, attractive units without hefty service changes and multi-let complexities. Malaise in retail occupier markets and negative sentiment generally have prompted widespread correction in investment markets. But where do we see opportunity, counter-cyclical or otherwise? Income is the key investment case for retail. Income returns in retail are higher than other sectors and geographies. Underperformance → overcorrection → outperformance? Despite deep structural change, retail markets will ultimately stabilize and recover. Those three areas leave a lot of ground uncovered and any generalisations about the prospects here could be easily shot down. As ever, prospects are completely asset-specific and a detailed understanding of current dynamics, especially trading performance, is required before forming a view. What is clear is that the prospects for many assets in the “middle” market are questionable. Many such locations are undergoing considerable change. Many are losing department/ variety stores. 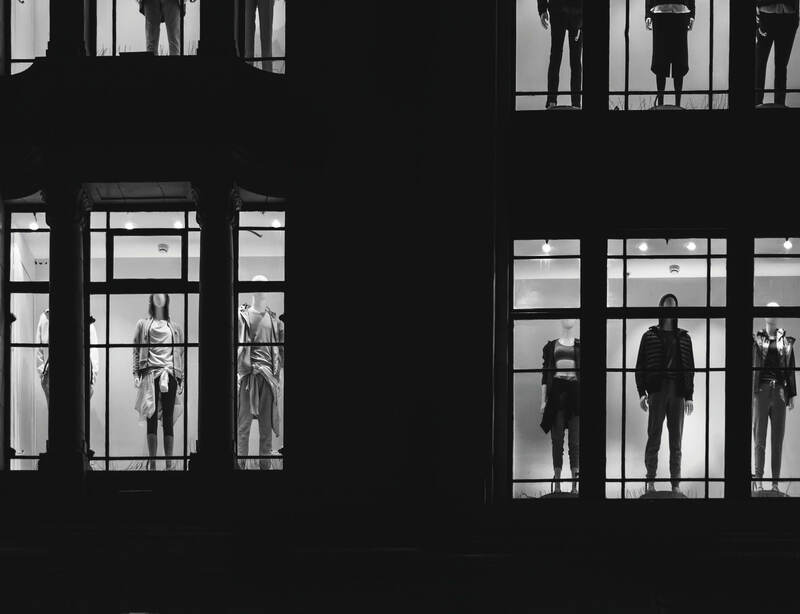 Will fashion retailers follow them out the door? And with that loss is the amount of retail provision sustainable without those key draws? Will such locations continue to lose out to regional and convenience locations at either end of the market and will the growth of e-commerce make such locations increasingly irrelevant? What will be the ultimate impact on affordable occupational costs? In most cases we simply don’t yet know. Landlords are uncertain, retailers are uncertain and agents can only make a best guess. It is a grey area. There are, however, different shades of grey. Those locations with a sizeable catchment and a degree of dominance will continue to operate as retail. There is a need for “community malls” in the space between experience and convenience. These locations may experience a reduction in fashion provision and landlords will need to be proactive to find attractive replacements. Some space will be taken by leisure users, and not just cinemas and restaurants. Think Namco, soft play, wall climbing and trampolining. Some space will continue to be absorbed by value retail – B&M and Home Bargains appear here to stay. And some will be taken by the grocery sector, particularly Lidl and Aldi as their ascension looks set to continue. Residential often underpins a cry to turn struggling retail sites into “mixed use”. At Knight Frank we are well placed to examine this and have spent a considerable amount of time assessing opportunities. What is clear, however, is that it is not easy to make such appraisals work. In locations where residential reaches a viable value of £400/sq ft+, often the retail still remains too valuable to warrant demolition or even adaptation. Perhaps as retail continues to fall in value and if residential starts to rise again this change of use will get easier to unlock. However, it would be wrong to assume that conversion to residential is the wholesale redemption for the failing retail market, at least not for now. Within smaller catchments, at local level a modest retail offer should survive, albeit retailers may need to be offered flexible deals and turnover rents to try or even stay in such a location. It is in these markets where we all, landlords and retailers alike, need most help with the cost of rates. In many such locations rents have fallen (or are falling) by 30%+ (often 50%+) and we need the support of central government to keep these locations viable. Of course, there are some locations where it is difficult to feel confident about their medium-term prospects. Over-supplied markets offering no real dominance within the local retail hierarchy; locations with a poor environment offering no sense of experience to their shoppers, yet being too big to work as purely a local convenience. In such locations, retailers will leave unless their units make a sustainable contribution to profit. Where gaps appear, new entrants will be difficult to attract. The landlord here faces an on-going battle to maintain income and it is these locations where one might be better to watch matters unfold, rather than think you can win the battle. The relationship between some landlords and tenants can, at times, be a strained one. What opportunities and mutual benefits do you see through closer collaboration with landlords? Not sure “hackneyed” is quite the right word – that suggests it is not a reality. There is no doubt that online shopping is growing at the expense of visits to physical stores. The point, as I have referred to already, is that they serve different needs and can be (and should be) complementary. Shoppers now want absolute convenience and instant gratification. They don’t really care which channel they use to shop and will use stores and online for different or interchangeable reasons. Our challenge as a retailer is to make sure that the customer experience is seamless and pleasurable, whether it is in store or online. This means not only encouraging store staff to understand that the web is not a threat, but simply all part of the service to the customer, but also ensuring that the web helps drive footfall to stores if it is more convenient. The rise of e-commerce is obviously a huge driver of structural change in retail, but the whole ‘online supplanting physical stores’ thinking seems increasingly hackneyed. What is your view, as an established multi-channel player? The length of leases in other markets is generally much shorter than in the UK, although this is becoming more in line. The Belgian system, where leases are for a term of 9 years with Tenant only break options every 3 years, is attractive. Rent reviews don’t exist, but rents are indexed annually. In Ireland, lease terms are longer, but upwards and downwards reviews are included as a result of a change in the law after the 2007 crash. The US also has short leases of 3 years on average. 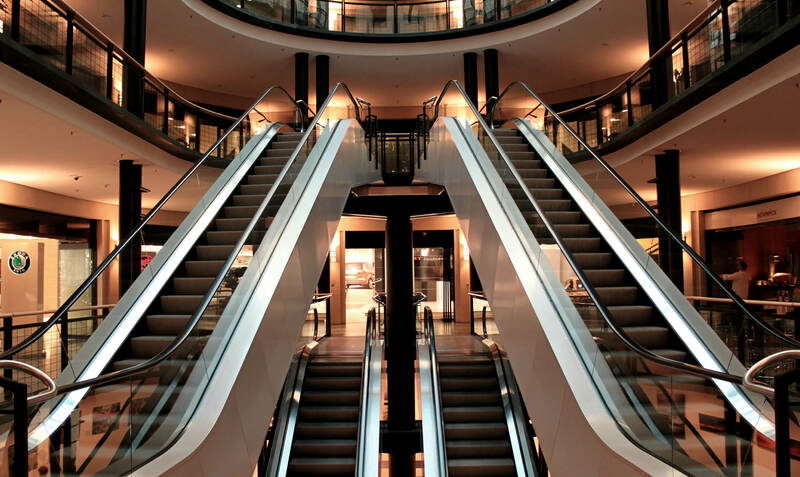 However, in Europe and the US, contributions to shopfitting are not as standard as in the UK, so some consideration needs to be given to rental levels reflecting a tenant’s requirement to write the capital expense off over a relatively short period. This would arguably depress rents further. Lease flexibility is the key change. We are able to negotiate short lease terms with either Tenant only, or occasionally mutual, break options at regular intervals. In poorer locations, rolling breaks can be agreed. The degree of power that lies with tenants is entirely dependent on the quality of the location (not surprisingly). Some retailers are also able to negotiate leases paying a percentage of turnover to cover all occupancy costs, so rent, rates and service charge. This is clearly beneficial for a retailer, who will be able to flex their expenditure depending on the level of turnover. And the advantage to the landlord is that they have the lights on. Incentives are still key to retailers, as often the contribution to shopfitting is fundamental to make a deal work. However, this is increasingly an issue for landlords, who are being asked to contribute potentially several hundred thousand pounds, whilst still conceding a break option after 3 years. They are actually becoming increasingly commonplace, but it is taking some time to modernise the turnover provisions in leases in the same way that other lease terms have modernised. I think they are only good if there is trust between the parties. Until very recently, there were often lengthy conversations around the value of a store to the web business. Like most retailers, we keep the two separate. Most landlords now agree that click & collect sales are not allocated to a store, and equally web returns are not deducted from store sales figures. Many landlords have provisions in their leases requiring tenants to provide sales information. We struggle with this, unless we have a turnover lease – so they certainly provide a mechanism for information. Personally, I also think that there needs to be an acknowledgement that the historic view of a turnover rent being 80% of the open market rent is ridiculous – turnover rents are a way of making a store viable for both parties. Again, the historic valuation issues around property assets has a bearing on this, but that is almost as difficult to solve as the business rates issues! I think we all need to look to the future and accept that fundamental changes need to be implemented to keep physical stores relevant to the modern world! This is obviously extremely topical and we (River Island) are increasingly active in trying to lobby Parliament for changes to the system. Quoting the BRC, “retail accounts for 5% of GDP, 10% of business taxation and 25% of business rates.” The facts show that the system is skewed particularly against the retail sector, where the mechanics of the valuations prevent any rapid reflection of market reality. It is also far too complex – with six different reliefs available, not including transitional relief. All these reliefs need to be funded by other areas of the rating system. Within the context of a cost neutral solution, in the short term, the removal of transitional relief should ease the pressure for retailers, but will necessarily increase costs for other sectors, most notably what the Government call “Central”, which covers electricity, gas and water supply networks, railways, telecommunications etc. Offices and Industrial, who currently overpay rates by a smaller margin than Retail, may also be marginally worse off. Annual revaluations would also assist in keeping the tax relevant and moving with the market. The latest 2017 List incorporated a significant change to the Appeals system. The fact that there are still 120,000 appeals outstanding from the 2010 List goes some way to explaining why a change was considered necessary. However, the Check Challenge Appeal system that has been implemented is unworkable and effectively prevents any appeals to the VO’s view of Rateable Values. The Digital Sales Tax announced in the 2018 Budget, and due to be implemented in April 2020, was, according to Jake Berry, “in some way, to try to ensure that we can level that playing field”. There is no real indication that this will come close to doing that. 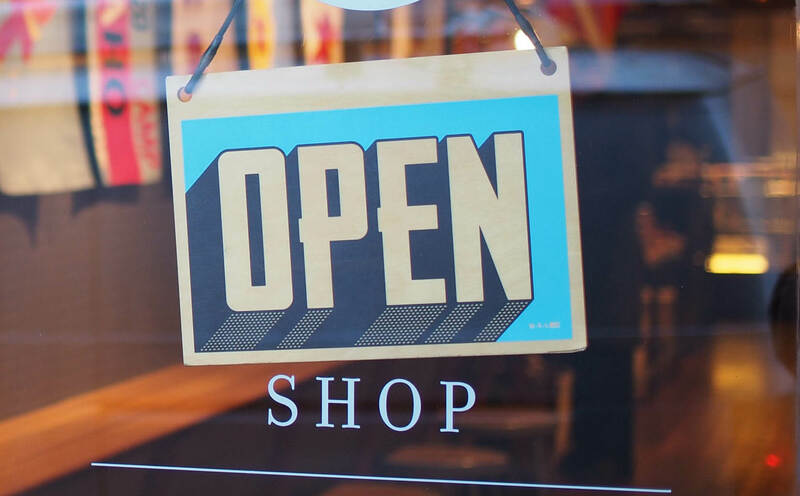 In addition, many substantial high street retailers have significant digital businesses, so it is possible, in the absence of any real detail, that they will be penalised further if there is no reform of the business rates system. Some people believe an increase in VAT will assist, and this is certainly fairer, but I suspect politically less attractive. 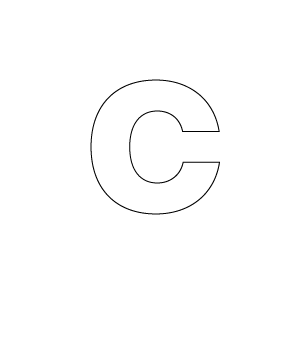 I think they create as much tension for retailers as landlords – it is fundamentally unfair that a company, often loaded with debt and possibly operating inefficiently, can create a situation where they reduce their rent roll and operate on a lower cost base than a well-run company with no debt that is unable to create a situation to launch a CVA. 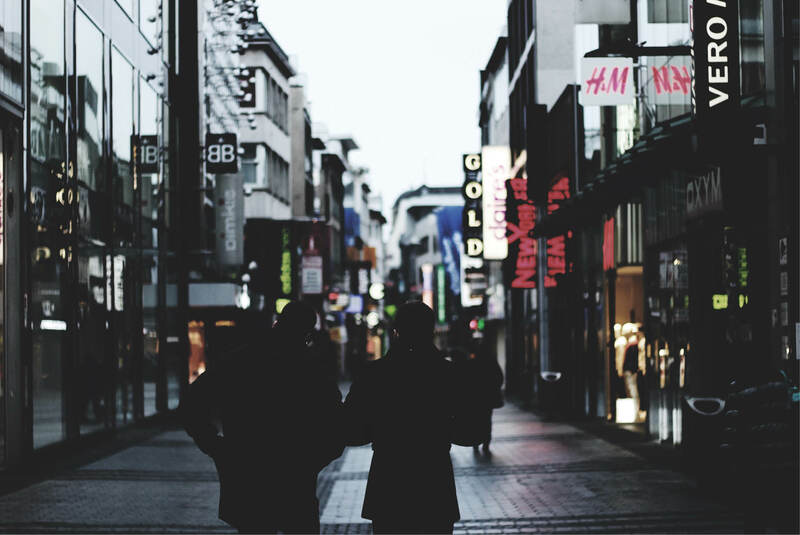 Reports of ‘death of the high street’ are definitely over-blown, but the retail market clearly faces a number of challenges. As a major high street retailer what do you see as the key ones? Yes, we are still acquiring, but only where we can do flexible deals for profitable stores and despite the fundamental understanding that ultimately we don’t need as many stores as we have now. The key driver is the growth of kidswear, which has expanded across the age ranges up to 12 and including a newborn range. Frequently, we are adding space to existing stores, although we have, on occasion, relocated completely to cheaper locations, where, even with a reduced turnover, we will be able to make a better profit. 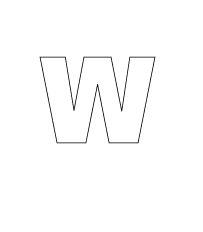 We are also working on some consolidations where we only need one store in a town. The key point is that no store is sacred. If a store doesn’t make money, and we are able to exit, we will. The old idea that we MUST be in certain locations simply has no validity any more. With an online store and a wholesale business, we can expose ourselves to customers without an expensive physical flagship, if that flagship is not profitable. Based on your experience are there any lessons that the UK could learn from overseas markets and are there ‘best practice’ structures that could potentially be adopted here? The balance of power has historically been perceived to be with landlords, but the playing field is arguably now more level. 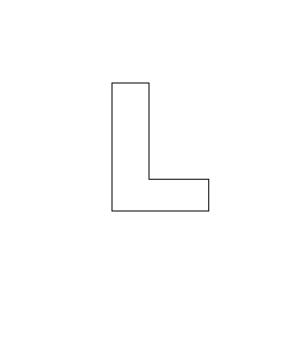 Are you seeing any other changes in leasing structures (e.g. incentives, lease lengths etc)? What is your property strategy at the moment? Are you still acquiring? You branched into childrenswear a few years ago and opened your first standalone River Island Kids store last year. How is the childrenswear side going and what are your plans going forward? The obvious benefit is the ability to keep shops open! In the current climate, both parties can be rather defensive of their positions and sometimes there can be an apparent lack of trust between landlords and tenants. Whilst most tenants do acknowledge that it is hard to do the deals that are needed to keep a shop in profit in the context of the valuation methods adopted by the investment market, the reality is that the only way retailers can keep stores open in the face of declining sales is with flexibility and reduced rents. There are other factors which can cause tension – even something as simple as opening hours. I have frequent calls from our managers in big shopping centres asking if it is ok to close earlier than the official centre opening hours as the costs of keeping the store open are often greater than the sales that can be taken. I acknowledge that in order for local changes to happen our store managers need to engage with centre managers, but it would be helpful for all teams to have support at Head Office level from both sides. 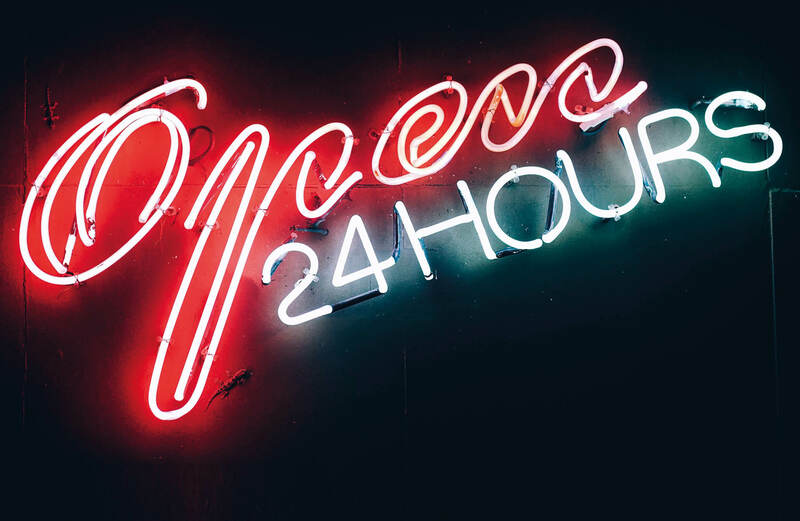 Our experience is that centre managers can take the request to close earlier as a personal affront, but the reality is that we all need to manage costs – shorter opening hours will also save costs on the service charge. The challenge of capital expenditure is also something that perhaps needs to be considered. Most retailers expect considerable contributions to their shopfitting costs, yet this can be challenging to landlords when they might only be getting a turnover rent. Perhaps we need to all review how we work out what is profitable, whether that be lower rents, less capital or cheaper shopfits. It is almost as tricky an issue as fixing the way that shopping centres and ultimately share prices are valued. Turnover rents are often seen as a logical, transparent and fair way to structure rental deals, yet they are far from commonplace. Do you see that changing and what are your views on turnover rents generally? The most obvious challenge is the change in the way people shop and the rise of web sales, whether they are undertaken on mobile devices or via a PC. Growth in sales on mobile devices is increasing at the greatest rate of all methods. The reasons people visit high streets now are different to the pre-internet world – they may be shopping in the traditional sense but are just as likely to be returning a purchase either bought from another store in a different location, or from the web, or picking up a click & collect purchase. Costs are of course fundamental, and the business rates issue is increasingly in the press and now, of course, being considered by Parliament. Although we are able to manage rents on new leases, most retailers, including us, have some legacy leases with excessive rent liabilities which, exacerbated by rates, can have an overwhelming effect on the viability of a company. CVAs amongst retailers are understandably a very contentious issue. Landlords clearly have their view, but how do you see it from the retailer side of the fence? If you had just one key message to pass onto landlords, what would it be? Business rates – most landlords and retailers alike agree that the current system is inequitable. what are your views on business rates and what alternatives are there? Kidswear is doing very well and is definitely the growth area of the business. In 2018, the increase in physical space increased sales by 9% YOY in this division, although the online growth was more than 3 times this level. Livingston, Ballymena, Hull St Stephens and Romford are all stores where we have added additional space adjacent to our existing stores, allowing us to regear the leases, create space for kidswear and ensure profitability for a period, whilst also building in lease flexibility. We have too many stores in the UK and this will reduce through lease expiry, some unfortunately through retailer failure. This reduction may feel drastic for some towns and city centres, but it offers an opportunity to bring in new uses to support a strong sense of community. Arguably we’ve been too reliant on retail, and a mix of uses will better suit our modern lifestyles and encourage new independent local businesses to come through. Local authorities also have a big role to play as they have the best ability to influence most high streets and many are starting to do this. The relationship between some landlords and tenants can be a strained one. What opportunities and mutual benefits do you see through closer collaboration with retailers? Clearly, the high street does have a future but, on a very generic level, what do you think the future role of the store is? Firstly, the network and the number of stores a retailer needs is undoubtedly being re-assessed towards a balanced online/offline model, accepting that there is a huge variance when you look by category and frequency of spend. Then the role of a store itself will increasingly reflect the importance of building brand loyalty, as will using the store network as part of the fulfilment response. Zara’s recent announcement that they will ship from store in 2,000 locations globally is a very strong signal. There are some great examples globally of how physical and digital successfully fuse together and this is the future for the industry. We don’t think in terms of landlord vs tenant. We think there will be a natural gravity towards not only the best locations but also owners who work well with their customers, the retailers. We need great retailers in this country, but we also need great owners to work with them. Physical places, which support online and bring them together, have a very real future. It’s not going to be easy and we’ll continue to see polarisation across the market, but it is possible for forward-thinking brands and owners of real estate to navigate this difficult shift. Oversupply is widely identified as one of the structural weaknesses of the UK retail market. How can this fundamentally be addressed and what needs to change for this to happen? 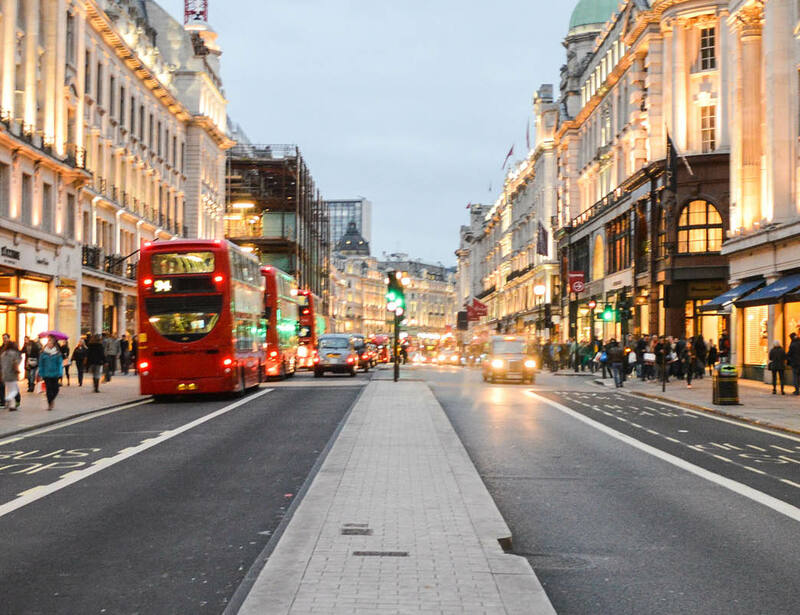 What has British Land done to future-proof its retail assets? And what for you constitutes a good retail destination? The parlous state of the UK retail market has been well-documented. What, for you, are the biggest challenges the high street currently faces? And where are the major pinchpoints? CVAs amongst retailers are understandably a very contentious issue. As a major landlord, what are your views on both CVAs generally and also how the process is handled? We have been repositioning our portfolio over the past few years; we have sold over £2.4bn of retail since 2014 for example. We have also invested in mixed use locations where retail is a key driver. Across the portfolio we have focused on ensuring our environments are both future-proofed and importantly places where people want to visit. This ranges from public realm improvements, increased flexibility of spaces, F&B and leisure, events programmes and making sure the infrastructure for wi-fi is in place. We are a relatively mature online nation, as in we are second only to China in terms of sales penetration at c.20%. Where we will end up is a debate but even if online sales double, we will have say 60% of sales going through physical stores. More importantly, digital and physical channels will be feeding each other. This is a natural, consumer-led, evolution and yes that means we need a smaller retail footprint in the UK. The big pinchpoint is the arrival of economic and Brexit-related issues the same time as the structural shifts are taking place. This acceleration has put significant pressure on retailers and margins, particularly those with legacy models and store estates. It is worth noting there are many retailers who are successfully charting a course through this. The industry collectively has learned a lot of lessons from the application of CVAs over the past year. The use of CVAs has travelled quite a way from what they were originally proposed to do in the 1986 act. This is in part demonstrated by the fact the BPF has needed to issue a red flags list. This area needs a very robust stance, not least because there are many retailers who are not needing to take this course of action and are frustrated that others are able to. Proactive intervention will be needed if the retail market is to address and overcome the structural challenges that threaten to undermine it. The market will not right itself on its own. Here we explore six key pinchpoints on the property side, where Landlords and Tenants may not necessarily be in harmony. Landlords understandably argue that full transparency should be a pre-requisite of any turnover rent arrangement and that full sight of turnover projections and trading data from comparable stores is necessary to assess any “turnover rent“ proposal properly. There is some variation amongst retailers as to how much information they will convey in negotiations leading up to the grant of lease - they are rightly protective of their trading data and seek to limit its release into the public domain with competitor concerns. There is also hesitation over how it might influence deal outcome partly responsible as well as sensitivity over misuse or re use of any turnover comment or information given. Once a lease is signed and the turnover rent set in terms of percentage, the tenant will be obligated to provide audited trading figures to the landlord for the store. This is usually quarterly, with annual audited figures in arrears. In some cases, there may be a ratchet applied to set a base rent for subsequent years, but increasingly this is less common. In stronger trading locations, the push may be more toward fixing a current market rent and a fixed rent may be preferred. However, in some cases, landlords may manoeuvre toward a turnover type lease, as a means of bridging disparate views over rental value impasse, without either side conceding crystallisation of a rack rent figure that might have wider implications on asset valuation and that may not be affordable for the tenant. Turnover rent percentages vary depending on the type of retailer. There is wide variation between fashion, discount, health and beauty or leisure and restaurant operators, for example, but generally higher density sales mean lower turnover percentages, and vice versa. Inclusive turnover rent leases are still not that common and are mainly in the fashion retail sector, partly down to the leverage key fashion brands have. But they do occur in other sectors and generally at turnover rent percentage levels of 12–15% (including rates and service charge), but can be slightly lower or higher. Not all retailers push to agree turnover rents over a fixed market rent approach. It depends on location and particular circumstances. Equally, they can be beneficial to landlords, generating additional income over base or fixed rents, where trading conditions allow. The model has evolved from the base and turnover, or rack rent with turnover top up approach of a decade or more ago. This was introduced in some of the largest regional shopping centres at a time when rental growth was prevalent (and expected) and seen genuinely as a means for Landlords to share any exceptional store trading performance via the possibility of overage or “top up” rent on top of the lease rent. It has moved to the current scenario where, more commonly, turnover rent may be just that - a rent based on an agreed percentage of gross turnover (VAT exclusive), with a low base or on account rent. Generally, the turnover rent will be exclusive of rates, service charge etc but also frequently now in the fashion sector (and increasingly other areas as well), where the turnover rent will be set at a percentage to be inclusive of rates and service charge cost. transacted directly in and from that store (ignoring wider online platforms) is normally accepted. However, individual wording may vary slightly, with most retailers and landlords having a standard drafting they will seek to adopt. Generally, the less confident a retailer may be over a particular location, the stronger the preference will be to adopt a pure turnover rent approach, either exclusive of rates/ service charge, or where there may be real concerns or uncertainty, on a fully inclusive model to include rates and service charge (the tenant registers with the Local Rating Authority and pays rates directly, but these are then offset against the rent due calculation when annual balancing audit is carried out). This structure can effectively de-risk the deal for the tenant, fixing occupancy costs as a percentage of turnover. From a landlord perspective, it can facilitate deals with key tenants in some cases and in some locations which otherwise would not be possible under a traditional rack or even geared base and turnover approach. So, it is fair to say there are benefits for both sides, although the retailer will have greater visibility of likely rent outcome. urnover rents are being increasingly adopted in the retail and leisure sector, but not without hesitation and debate between owners and occupiers on how the “turnover” rent should work and whether it is equitable. In theory, a pure turnover lease rent is the most direct reflection of trading performance and return based on location and specific site for both sides. But it will never be completely transparent given diverging interests of landlords and tenants, when it comes to minimising cost on one side for the occupier, and maximising return through rental income for the landlord on the other. There is also the constant and ongoing evolution of online and in-store trading models and the interaction between the two. Plus the obvious fact that trading data is unquestionably sensitive for retailers and akin to your personal bank details - not something that you would want out in the public domain! The current valuation and funding models make turnover leases difficult to value and finance. 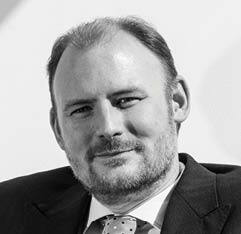 There are also some issues in event of Court Determination at Lease Renewal having to award an open market rent figure rather than pure turnover rent, so whilst they might generate income and work in many cases, we aren’t likely to see a complete shift to the turnover lease model across the board anytime soon. But turnover rents in their myriad of forms are here to stay and their structure will continue to evolve, reflecting retail and leisure sector market realities and online and in-store trading evolution. Whilst the purist valuer will argue that the net rent is X and the tone is now Y, the market is finding its own balance to satisfy the demands of each party. The tenant is not necessarily concerned with the value of the overall asset, merely that the store makes a profit and this is what the landlord needs to worry about as well because a profitable tenant pays the rent and wants to remain trading, delivering for the landlord a sustainable Net Operating Income. So what is an incentive? The dictionary definition is ‘a thing that motivates or encourages someone to do something’. So in its purest form yes, the rent free period or cash equivalent does encourage or motivate a tenant to occupy a unit or property but only if it is perceived that the terms of the occupation will be economically viable. But, from the landlord’s perspective this is also true as they need to be encouraged and motivated to proceed with a deal that is to its economic advantage. So ‘incentives’ are still a relevant thing but must be considered in the wider context of the ultimate goals of both parties. There will be a level in each individual circumstance where this works, but in others there won’t and the negotiation will break down. But each transaction is different and the ‘incentive’ or ‘contribution’ or whatever it might be called is the thing that will facilitate this and help deliver the wider transaction. or rent free to cover any works that need to be undertaken supposedly outside of the scope of the ‘shopfit’. By redefining the reason for the incentive, does this mean that the tenant would have taken the unit had the ‘supposed’ works to the unit been undertaken? The market as well defines what a tenant might be able to get as an incentive. If demand is high the availability of one, if at all, is reduced. Market forces – supply and demand. But in this market those instances are few and far between. So we come back to the original question as to what exactly is an incentive. The landlord is concerned with maintaining a ‘tone’ and a valuation, whereas the tenant is concerned with making the unit a viable trading entity and therefore want as much of a contribution toward that start-up cost as possible. So we have conflicting agendas that are totally intertwined and cannot survive without each other. It therefore becomes a negotiation with each side wanting to maintain their own agenda to achieve their own goals to the mutual satisfaction of both parties. hat is an incentive? To a tenant, it forms part of the overall deal and is included in the total cost of taking occupation of a specific unit and forms part of the investment the tenant needs to open the doors. To a landlord, it is a cost that cannot only apply to a specific unit but can materially impact on a larger holding. How it is made up is also a bone of contention between the two parties. Is it cash or rent free? Or does the landlord carry out works to deliver a store ready to accept the tenant’s fixtures and fittings? This is where the problems begin. For an occupier, the cost of opening a store is largely the same wherever they open, be that Billingham or Bluewater. As an occupier you need to see a return on that initial investment that includes the shopfit, stock, marketing and hiring of staff. All of these, depending on regional variances, are roughly the same and so for lower turnover stores that investment needs to work that little bit harder to make a return. course, preferable from a landlord/ investor perspective, allowing re-balancing of rent to reflect market conditions at the time. The additional breaks sometimes sought between years 3 and 5 are a result of faster shop-fit repayment periods - historically this entailed 5 year write down or more, but can now be recovered much more quickly. They are also fuelled by concerns over any future significant increase in rental values, out of step with current market expectation. They also reflect most retail appraisal bases adopted by occupiers, which factor in estimated annual compound reduction in physical store turnover sales to the wider online platform. For some retailers, inclusion of Tenant Breaks has been a more recent pre requisite introduced over the last 18 months or so. Others have taken a corporate stance to include flexibility on all new leases for a much longer period, albeit compared to say 2 or 3 years ago, when a 10 or 15 year lease with a single break at 5 or 10 was most common. 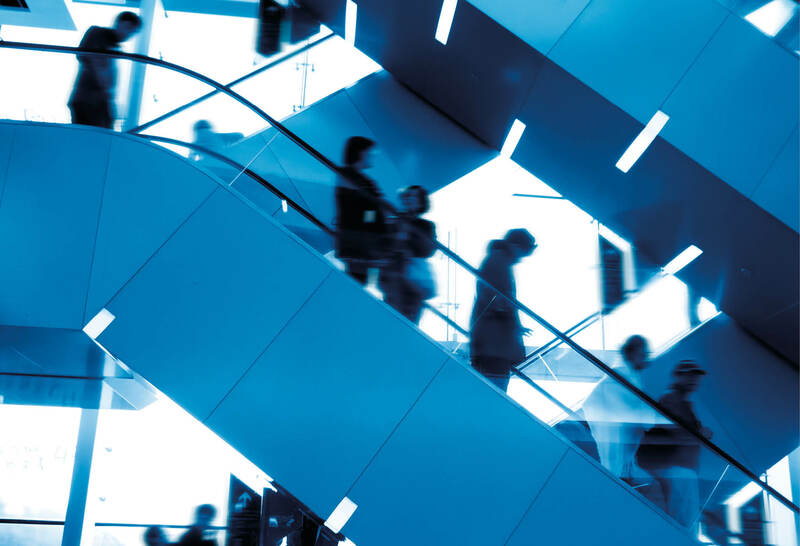 It is understandable that retail occupiers value flexibility so highly – on a business level, it allows greater reaction to a changing retail environment and individual merchandising and concept change. Retail is, by definition, a dynamic business and those most successful at it constantly seek to evolve and refine their offer and retailing platforms across physical store portfolio and online. Fashion operators tend to push hardest for flexibility and are perhaps most likely to achieve it in lease negotiations, as they have additional leverage in their capacity as key target tenants, particularly in shopping centres. There are still retailers (particularly the food and value operators) who feel they may leverage better financial terms by taking fixed 10 year leases or even greater, and these are more secure term options for landlords to pursue. It’s also worth stating that irrespective of any break patterns, most leases still include 5 yearly upward only rent reviews, providing some certainty on minimum future rental income. It is also worth stressing that providing a shop is profitable, it is highly unlikely that an occupier would actually action a break clause - unless they intended re-siting or had particular concerns over a significant future change to the retailing environment, such as perhaps in the case of an in town store, a new out of town or retail park development or perhaps a concern pre review of any significant rent change, for example. 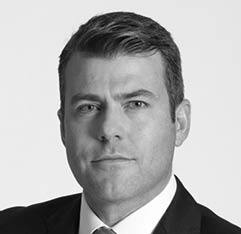 For an owner, expertise and market knowledge will be key in understanding and taking appropriate action in respect of any indication by the tenant that they may break the lease, and identifying on a case basis whether the threat is negotiation-based or reflective of a more fundamental trading concern. In Scotland, the absence of any Landlord and Tenant Act protection means that there is arguably a more even playing field between landlord and tenant at renewal - with the tenant having no automatic right to renew and the landlord having the ability to get vacant possession on expiry if they wish and in the absence of action from either side, the lease rolling on for a further 12 months at the existing rent. Nonetheless, lease lengths in Scotland and break situations remain pretty much the same as in the rest of the UK. There is a suggestion that at Government level some form of overhaul of the Statutory Lease Renewal process is needed to make it more reflective of real world situation. Upward / downward rent reviews have been widely debated for some years, but have never really gained traction. It is very rare to see them in leases in the UK and they are not something that really feature as a major negotiating point with new transactions - perhaps surprisingly, as there is an argument that certainly some but not all retailers may well be willing to commit to longer fixed term leases again, if they included 5 or even 3 yearly upward/ downward rent reviews over, say, a 10 year fixed term. It is more likely that reviews will remain upward only and occupiers seek to cap or percentage increase limit on review. We expect there will be further and more rapid evolution of lease structures over the next 5 years, reflecting the undoubted and ongoing structural change to the retail sector, particularly as the online/ in-store relationship becomes clearer. that in any market attract occupiers, foresee market changes and respond accordingly. 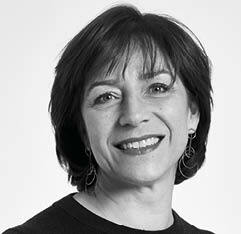 At the heart of successful ‘place making’ is a fluid and open relationship between landlords and tenants and at a time when retailers are expressing caution, landlords need to respond accordingly. The fundamental make-up of any negotiation has not changed in Central London. Instead, the current market affords the tenant more opportunity to drive better financial terms. landlords who are focused on driving and delivering a dynamic, innovative tenant mix strategy, rather than extracting greatest income, generate the most exciting and successful environments. Landlords who are starting to accept values are not what they were 12– 24 months ago are still able to secure operators for space, as London is still in demand. These operators are just more considered and discerning in any decision-making process (rightly so) and will want to be seen to be getting ‘a deal’ on the ‘right’ terms for them. If the terms aren’t right and do not give sufficient comfort and flexibility, operators seem willing to hold off until the right terms present themselves. However, while prime stock that is correctly priced is somewhat immune to a lethargic occupier market, we have seen a sharp rise in shorter term and pop up opportunities. There is no denying that there is friction between the online world and bricks & mortar stores. While shopping online is beneficial in terms of cost and convenience, it is no replacement for the experience that a physical store can offer. A flagship store can act as a showcase for the brand, allowing customers to live and experience the ethos and brand story. Brands see pop-up options/short term agreements with built in flexibility as great exposure and brilliant marketing tools, allowing the opportunity to test new markets without the need for large upfront set-up costs. For landlords, this can bring fresh content and energy to their estates, ‘exclusivity’ being one of the fundamental factors that landlords try to achieve in their tenant mix plans, which creates a point of difference to their portfolio and drives footfall. Comparing the lease terms on short term/pop up agreements with the more traditional lease is not really possible. Central London has not seen any major fundamental shift in lease terms especially with the bigger and prime developments. Tenants are looking to build in more flexibility or take shorter leases where possible but we are yet to see any seismic change, such as upward/downward reviews, for example. The uncertainty of the market means increased caution and more than ever, retailers seem willing to wait for the right deal to present itself. Landlords are still capable of securing long term income on so-called standard institutional leases, albeit potentially with the presence of breaks. Yet while tenants will continue to push on the terms of any transaction, a successful outcome can still be achievable for both landlords and tenants assuming an open dialogue continues and the relationship is maintained. from dawn ‘til dusk is because they’re obliged to. There is obviously a compromise to be reached as different retailers see core trade at different times of the day, but an hour a day less on centre opening times can lead to a significant saving on the service charge budget. Balance is the key. Landlords are increasingly willing to try and work towards reducing the service charge, and savings can be made without compromising the performance and future of their asset. simple way to protect their position from increasing costs is to simply request a cap. As the markets have moved further into turmoil with Brexit looming, there is an increasing trend from retailers on acquisition and at lease events to demand deals which cap not only the service charge but also total occupational costs. The service charge budget has historically been seen as an immovable object, but as market pressures on occupational costs increase, service charge budgets are coming under increasing scrutiny. With a growing number of leases moving to an ‘all-inclusive’ basis, the reduction of the service charge is increasingly becoming in the direct interest of the landlord; every pound saved on the service charge is an extra pound of income. When the scrutiny starts, there are two main areas of the service charge budget which come under the spotlight. The first, and most contentious, is the marketing budget. Back in the stone ages before social media, the marketing budget of the shopping centre was a useful tool to connect with the customer and promote both the centre and the incumbent tenants together. Ask a national multiple retailer today whether they think they get value for money out of the service charge marketing budget and the answer is almost unanimously no, even when the landlord picks up half the tab. Retailers have their own marketing platforms, which have become more sophisticated. They have insight into their shoppers’ habits and trends, they know how they want their brand to be perceived. All of this means they see very little return from the centralised marketing of a shopping centre and would forego it for a service charge saving. The solution is to scrap the retailers’ half of the marketing budget, and focus the landlords’ contribution on centre marketing, supporting the local and independent tenants, and funding events. So what difficulties does this cause the valuer? The consequences are multiple as one attempts to (i) assess a sustainable income profile in the face of continued occupier change (ii) identify appropriate market rents predicated on varying tenant affordability and (iii) understanding the effect on investment yields driven by adverse investor sentiment, interspersed with divergent comparable investment transactions. Therefore, while the gross and net cashflow of a centre will be factual at a given point in time (the valuation date), the skill of a valuer is to also identify the de-risked sustainable income which an investor will look at when seeking to purchase. This is complicated by the multiple type of leases being agreed. It is common to have inclusive terms, base rent with turnover provisions or concessionary arrangements. That is not to mention increased flexibility with rolling breaks and varying incentive packages required to entice tenants to lease accommodation, in the form of rent frees and capital. Accordingly, the formulation of retail tones is becoming less relevant and harder to identify in the face of varying leasing transactions. Therefore, is it right to benchmark a rental value through a Zone A tone as a consequence of an adjoining transaction? What is clear is that identified market rents are unit explicit, having regard to that tenant’s affordability. In all but a few locations, the valuer is faced with setting reduced rental levels leading to over-rent, with the biggest impact on rental levels in relation to large space formats. This is not surprising in the face of the restructure of New Look, House of Fraser (in whatever form it ends up) and issues surrounding Debenhams, and quite likely Arcadia. Identifying the market rent of a large format store is a test and how one values a covenant that has expressed the need to restructure is even more complex. The valuer will need to look at the market practice and thought process of investors. However, in the absence of market evidence is there a common methodology to follow? Making sensible assumptions in anticipation of a restructured rent or potential break-up are options. Both will present difficulties and a range of outcomes. The residual value on break-up may also be minimal due to the associated void costs and capital to implement and will be the price at which a potential investor would dial into their analysis of “worth”. The wider ramifications to the scheme in the event of an assumed large space tenant disposal also needs to be reviewed. Interpreting returns and yields with limited evidence becomes demanding. Again, the skill is to interpret from all knowledge as with any sector-based comparable methodology. This needs to include quoting terms on schemes, vendors’ aspirations and an understanding of offers made and any conditions, not to mention who will purchase and on what investment rationale. Additional consideration must also be had where alternative use possibilities exist. So, are there alternatives to the current shopping centre rental and yield model? Could shopping centres move in line with the factory outlet model where landlords and tenants share in the performance of the scheme through turnover arrangements? Or, is the international approach appropriate where rents are agreed from the outset at affordable levels then to be reviewed in line with CPI? Could either partially mitigate the need for the current decline seen in the retail occupier market and could similar practices help maintain the viability and vitality of some of our failing centres? 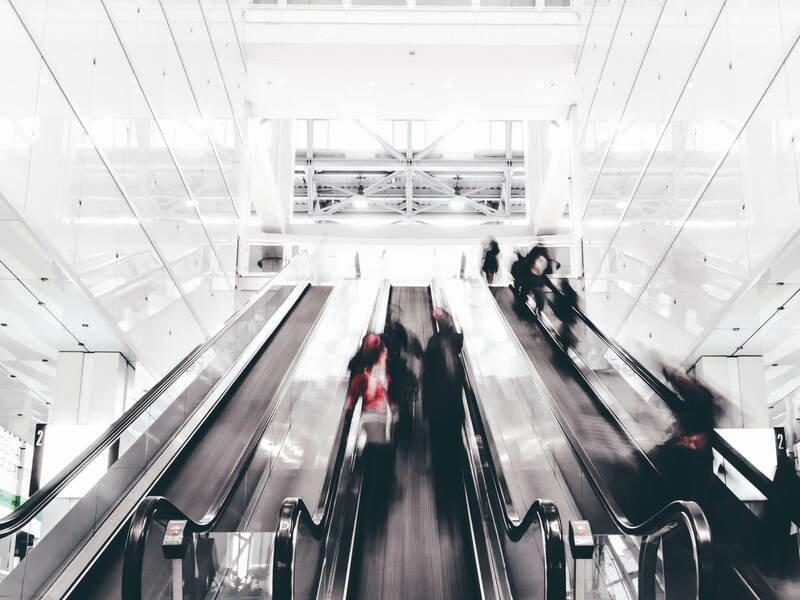 In the current market, it is only with the benefit of a strong and cohesive retail occupational and investment agency team, that a valuer can truly begin to formulate a meaningful view on the valuation of a shopping centre. And for those wanting to enter the valuation community, never will there be a time when appraising retail assets is so time-consuming, testing and satisfying. change and occupier headwinds of increasing costs (to include recent increases in the Living and Miminum Wage/Employer Pension Contributions), it is not surprising that there has been pressure to bear on retailers’ profits, in particular those who have been slow to adapt. Therefore, a re-focus on profitability and the physical need for each store during rationalisation is inevitable. 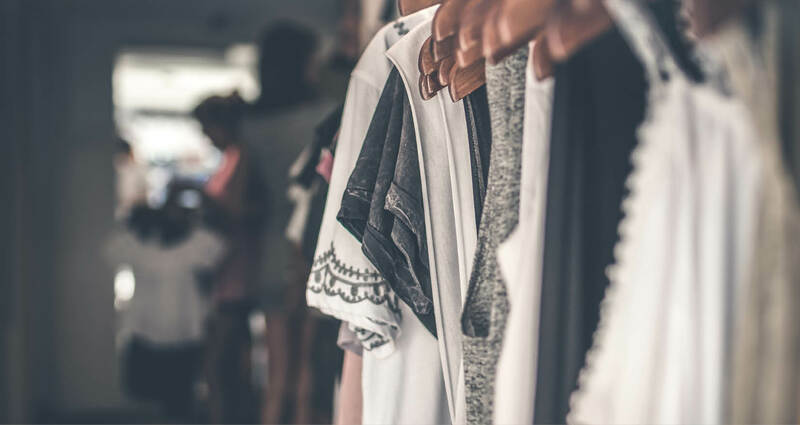 The continued and growing use (and abuse) of the CVA system has provided an apparent quick fix to right-size a retailer’s footprint across their portfolio and to manage out unprofitable stores. In turn, landlords in general, through effective asset management, are left, at best, standing still as net incomes decline through tenant corporate restructuring which is largely out of their hands. The list of creative ideas of how to tax online retail more is extensive, but all unfortunately will ultimately prove harmful to the retail sector as a whole. The British Retail Consortium correctly points out, that while retail accounts for only 5% of the economy, it pays 10% of all business tax and shoulders 25% of the UK’s rates bill; it is clear then that the last thing the retail sector needs is more tax liability. If the playing field is to be levelled, then the focus should be on reducing the tax liability of physical stores, rather than simply taxing online retail more. Remember, most retailers have a presence both online and on the high street, so the analogue ‘us versus them’ mindset of online versus physical is archaic and redundant in today’s digital world. property relief being the most recent example in the 2018 budget. It penalises success; as an example, improvements to your property attract a higher rates bill. It encourages conflicting ideologies; local authorities retain 50% of business rates revenue and they want to increase that revenue, often by allowing new developments which are detrimental to existing stock. The method is madness; the gap between valuations is too long meaning the system lags reality, the appeals system means budgeting for the local authority is almost impossible, the varying multiplier provides stability of revenue for the government but adds to volatility for businesses. The list goes on. It seems unanimously agreed we need change, but as noted by the Treasury ‘the likelihood that the Treasury is going to be looking at doing something radical to the system is quite slim’. This is not unexpected considering the revenue produced from Business Rates is one of the most efficient taxes we have; it is easy to collect and difficult to avoid. In the absence of a radical overhaul of the system, what measures would help? We could move to more frequent revaluations on a yearly or bi-annual basis, to make the system more accurate and reduce volatility. The improved accuracy provided by more frequent valuations would also reduce the significant number of appeals, which has stood at an average of almost 400 appeals per day for the last 10 years! We could look at the implementation of a fixed rate rather than the variable multiplier. The current system requires that business rates system should generate a fixed yield in revenue year-on-year, irrespective of the state of the overall economy. A move to a fixed rate would make the system more reliant on the individual valuations, reduce volatility for the rates payer and make the system more responsive to the wider economy. The reality is that these measures are just papering over the cracks of an outdated system. When we start to look into the hot topic of levelling of the tax playing field between online and physical retail, more radical ideas start to emerge. The most common proposal as an alternative to business rates is an added sales tax or an increase in VAT for online sales. This is the obvious suggestion but the reality isn’t as simple as it may appear. Retail is omni-channel and the clarity on what defines an ‘online sale’ is blurred at best, thus any taxation on ‘online sales’ would need to overcome this minefield topic first – something the country’s landlord and retailers have been trying (and failing) to get clarity on for a number of years. Furthermore, and most detrimental to the sector, is that higher taxes for online sales will inevitably be passed onto the consumer, another headwind the sector could do without. There are many other suggestions. We could use a different methodology to value the physical assets of online retailers, primarily their distribution sheds. The value of these assets to the retailer is far more than the property value so the valuation could be based on profits method. Another more rudimentary suggestion is simply apply a different and higher rate to these assets. We can consider implementing a Green Tax on deliveries to hit the logistics element of the online retail world.